On a Thursday afternoon I drive north from Dallas, snaking my way through the tangle of concrete dividers, oversize billboards, and fast food restaurants that beleaguer both sides of the highway until I reach the flat plains of Oklahoma and, at last, the dry grasslands of southern Kansas. The grey sky intermittently spits on the windshield. To the west, pale blues and blush pinks smear the horizon. I listen to the wipers rub the glass and drink scalding coffee purchased at a McDonald’s in the middle of nowhere. What is it about long, quiet road trips, sailing over the flat land, that allows space for thoughts, little scraps of consciousness, to drift into attention? I sip my coffee as the spare country flies past, and think about — what? God, a little. And a memory from the week before, when I awoke in a frigid Colorado campsite to see the mountains encircling the valley crowned with snow. And this time last year, of course, when I first felt the unusual intimations of what would, a few months later, blossom into a full-out illness: Lyme Disease. I think about how happy I am to be alive, how thankful I am for my health, even as I continue to recover (compared to earlier this year, I am a new woman with only lingering discomfort in my hands, an occasional pinch of pain along my spine). I wonder about the wildness of a world where microscopic bacteria can invade my tissues and make my life a living hell, which in turn causes me to consider God’s place in this beautiful yet dangerous creation. I think about how much I love the book of Job because it acknowledges our human frailty and the ultimate absurdity of our attempts to understand God’s ways — how much more I trust Scripture because of Job’s place in it! Then, I am thinking about suffering, and how reading about Christ’s compassion toward the sick and debilitated while I myself was laid low evoked in me an unadulterated desire for Him to move in me with such healing power. Lofty thoughts, I suppose, if they were a little more fully-formed. Really, though, they are nothing more than fleeting speculations mixed with a sense of awe at my littleness in the vast expanse of amber and chestnut land extending on all sides, the drizzling rain, the stormy grey clouds, and the God who made it, calling it not just good, but very good. Good, but certainly not safe. Or perhaps safe in some ways — in the ways that matter (I am thinking here of the lilies of the field). I make my way forward along the dusky road (metaphysical and actual, as the sun sets and I near Wichita). I ease forward with dim understanding, my flakes of consciousness amassing to so much more. All traveling, be it an hour drive to a nearby state park or an overnight flight across the pond, requires taking risks, and traveling to a developing world country requires an especially long list of them. At the top: the risk that you may return home with a little bit of that country hidden away in your gut, in the form of a hungry parasite, perhaps, or an angry bacteria, or a mysterious and terrifying virus that conjures images of doctors wearing hazmat suits while tending to you in a sealed hospital bed. Less than twenty-four hours after my flight home from South Asia, the symptoms began. Stomach cramping. Bloating. Grumbling. And — ahem, I know it’s gross — some of that pesky traveler’s diarrhea. I didn’t think too much of it at first. After all, my stomach was adjusting to Western food after two months of rice, lentils, curry, and paneer. Plus, I’d been sick in India. 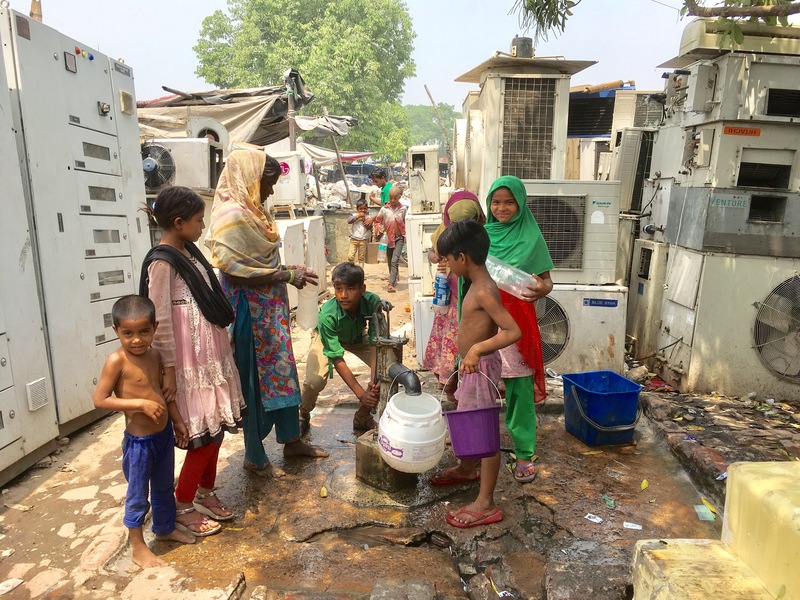 This bout of unpleasantness was probably the lingering remnants of the illness I’d experienced on the banks of the Ganges, dirtiest and most holy of rivers. But a week later, I was still suffering, so I did what you’re supposed to do: I went to the doctor. I was driving through the busy streets of Dallas when my doctor called. I’d been waiting for his call. I’d undergone a number of tests and was waiting for him to tell me the results. I wasn’t worried. After all, the symptoms were mild. When I’d met with him earlier that week, we’d amicably swapped stories about South Asia while he listened to my colon with his cold, silver stethoscope. The atmosphere was light. I wasn’t feeling great, but I wasn’t feeling terrible either. This upset stomach was just something to nip in the bud. I’d never been seriously ill before; I couldn’t be that sick now. I pulled off the side of the road and answered my phone. When my doctor told me the name of the mean bacteria swimming around my gut, it sounded like gibberish to me, like Greek, or Latin, which, of course, it was. “It’s a serious thing,” he said seriously. I had never heard him sound so serious before. In the span of five minutes, he used the word death more than five times. I was reminded of those TV commercials for the latest pharmaceutical drugs, where a mysterious man with a low, soothing voice speeds through a list of side effects while a beautiful woman and her equally beautiful golden retriever walk breezily along a sandy beach: side effects may include loss of sight, uncontrollable vomiting, temporary paralysis, oh, and DEATH. I scribbled everything down on a yellow sticky pad. I asked him the few questions that came to my mind, knowing I would have a million more as soon as I hung up the phone. I hung up the phone and started to cry. I thought: surely I didn’t travel all the way to Mount Everest and back only to die in the suburbs of Dallas. How absurd. How horrifying. How totally unfair. This is the way of the world: one moment, you’re healthy and carefree; the next, you’re not. Kurt Vonnegut comes to mind: so it goes. Joan Didion: life changes in the instant. The Tibetan Book of Living and Dying: all of life is a preparation for death. Earlier that week, I’d ordered E.M. Forster’s A Passage to India with the intention of learning more about the country I’d recently visited. But when I picked it up in the reserve section of the library and brought it home that day, I found I couldn’t look at it. I couldn’t even read the summary on the back of the jacket. Not that I held India responsible for the bacteria producing nasty toxins in my gut. 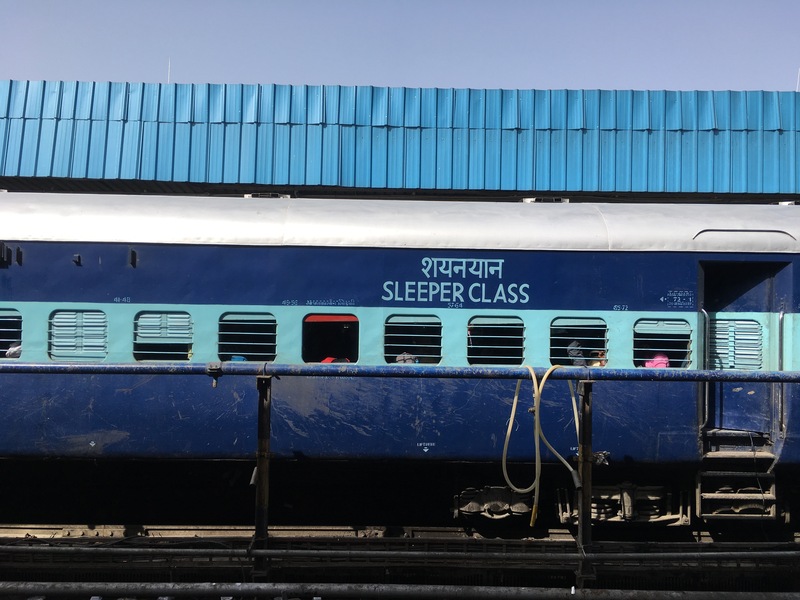 In fact, I still loved India as much then as I did when I was jetting around the country on its fabulously exotic trains. I still planned to return someday. I knew who was responsible: the brutal nature of the natural world. I just didn’t want to be around anything that reminded me of what was happening on my insides. I wanted to lie in bed all day and watch Woodie Allen films, which were the perfect mix of melancholy and humor. I wanted to take long walks around my neighborhood and soak up the sunshine. I wanted to observe every fat white magnolia blossom and run my hands through the faint mist of every front yard sprinkler. I didn’t want to look up my bacteria on webMD. I wanted to communicate the gravity of my situation to my family and friends, and at the same time, I wanted to remain lighthearted and optimistic. More than anything, I wanted the sharp cramps in my gut to go away. I ferociously, stubbornly wanted to be healthy again. Now that I’m on the other side of sickness, in the tranquil forgetfulness of health, I wonder if I was being dramatic. It’s a question I can afford to ask now. But when I woke in the morning to my stomach cramping, when, after the first round of antibiotics, my stomach was still cramping, when the fear that I would suffer from this bacteria chronically, for the rest of my life, ate away at my spirits as much as the toxins ate away at my gut, I didn’t feel dramatic. I felt reasonable when I asked for prayers for healing. I felt smart when I stepped down from various work commitments so I could focus on getting well. But now, in the glow of health, it seems odd that I ever thought I might not get better. We forget ourselves so easily. I forget what it felt like to run up against that hard fact of life: that I am my body, and without my health, my body doesn’t exist and neither do I. It gives a whole new meaning to the concept of resurrection. When I was sick, everything in my life became urgent. This is the silver lining to every illness: what matters to you becomes razor sharp. Don’t get me wrong, all illness is bad, being sick is awful, death is not something we were ever meant for. That said: paradoxically, we receive something even in the worst of circumstances. I don’t want to go to my grave without doing this! Or this! Or that! I acted out of that urgency. I wrote an old friend to explain how I really felt, a feeling I’d been afraid to voice for years. I took a good hard look at my life right now and decided it would be good, no matter what. I sent spontaneous, thoughtful text messages to friends. I walked around my neighborhood and cried for how beautiful it looks in late spring. I took long hot showers. I bought myself a brand new yoga mat. I read what I wanted to read. Some of this left me emotionally tired, but in the best way. I suppose it’s good that we don’t experience this kind of urgency all the time, that sometimes we’re complacent and forgetful about what matters. The weight of constant awareness is exhausting. Six weeks later, I got the call: I was bacteria free. I knew it was coming. I had already felt the change in my body: no more cramps in the morning, no more — ahem — diarrhea at night, no more grumbling and bloating after I ate. When friends and family members and well-meaning acquaintances asked me how I was doing, I said, “I’ve never been better!” I always took my health for granted, I said, but health is the best thing we’ve got. You feel so alive after recovering from illness. But the ghost of that angry bacteria remained with me. One afternoon, I felt a sharp pain in my side, and my mind flashed with fear: could it be back? Could some little microscopic bit have remained, multiplied, and colonized, heaven forbid? It hadn’t, thank God, and for at least that moment, I let go of the fear. I go to sleep in India, and in the morning I wake with my stomach roiling, the pain in my belly sharp and hot. I curl on my side, and sleep and sleep and sleep, the voices of my foreign roommates at the hostel in Varanasi close to my ear but far from my conscious. I sit up, nauseous, and curse the hostel for building its toilets three floors above on the hot roof beneath the relentless sun. I think, I’ve never been so violently ill in my entire life, and I wonder if I’ll be well enough to catch my overnight train that leaves in a few hours. One bumpy Tuk Tuk ride later, my scarf whapping wildly against the metal roof, my backpack balanced on one knee, we are at the train station. We are late, with five minutes until our train departs, and I run after Emma, my legs weak and my chest heaving and my belly tight. In that moment, I’ll admit it: I hate India. But then we are on the train, and I am lying down with my cheek against the hard leather bed and a crisp off-white sheet laid upon me. Eighteen hours passes fast when you’re exhausted, and the next thing I know, I awake in a pool of sun to the low call of “Chai! Chai!” from an Indian man carrying a metal thermos up and down the aisle. I order two fried potato somosas wrapped in newspaper and manage to keep one down. 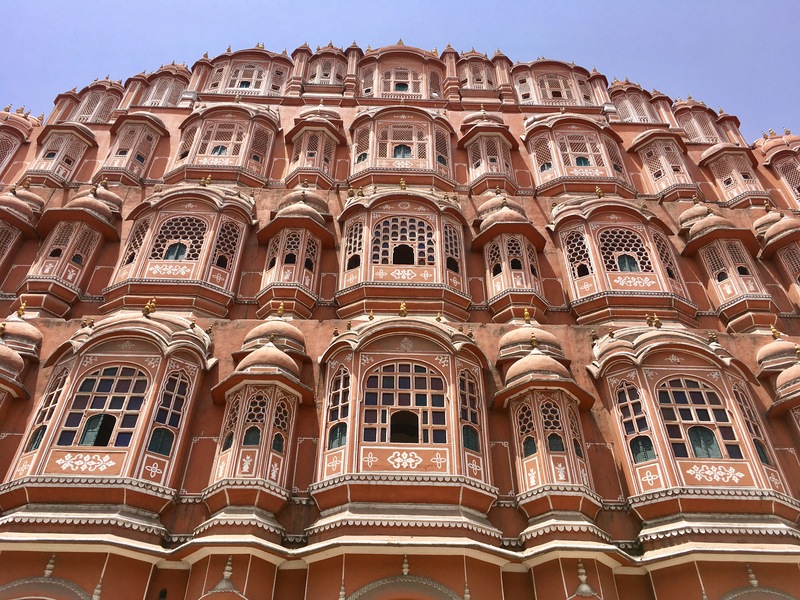 Then, we pull into Jaipur, Rajasthan. Suddenly, in the glow of my restored health, India blooms. 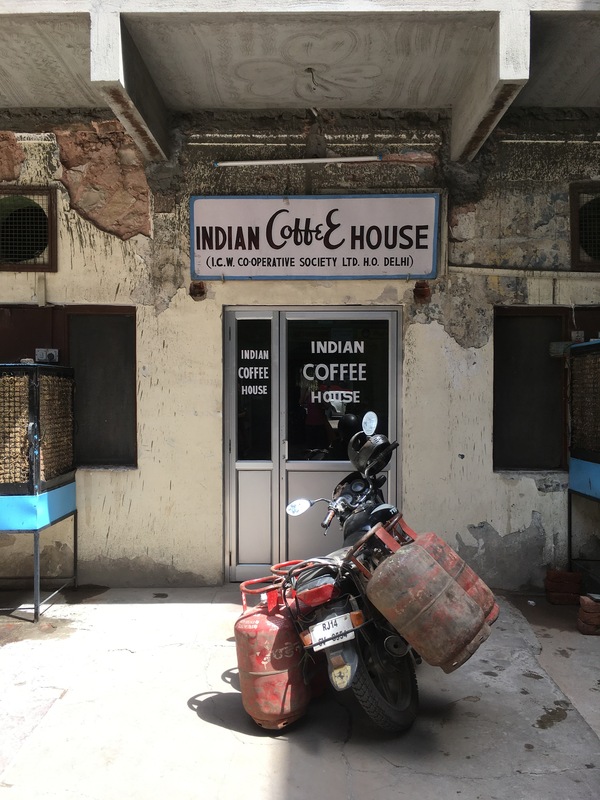 In the cool of an early morning, Emma and I catch a Tuk Tuk to a coffee shop in old Jaipur, where a waiter in a fabulous white and green turban with a stiff fabric plume serves us black coffee and French toast and eggs. Full at last and content, we walk at will through the bazaar, and the smells are so good: incense and sweet curd and hot red curry and so so so many flowers, soft red petals stacked in thick layers and strings of yellow marigolds and bunches of purple and orange and pink blooms. 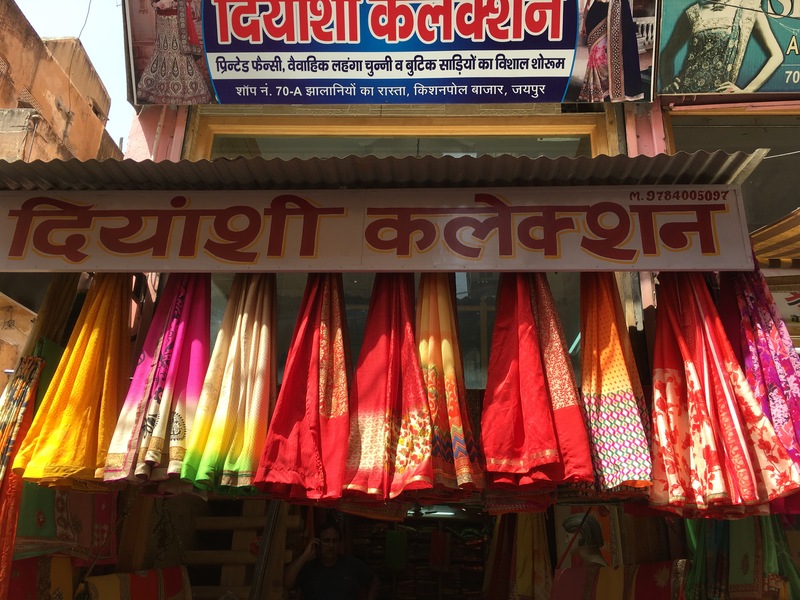 Women crowd stalls filled with sparkly bangles, trying them on in layers of six and seven colorful plastic rings jangling up their arms. They ooo and ah and tell me, “look at these, they’d look good on you,” and so I give myself over to the colors of India. I buy cheap bangles with purple and green and gold rhinestones and peacocks painted on the sides. I buy a long pink and green and silver sequined skirt. I try on a white sari that shimmers like real marble. 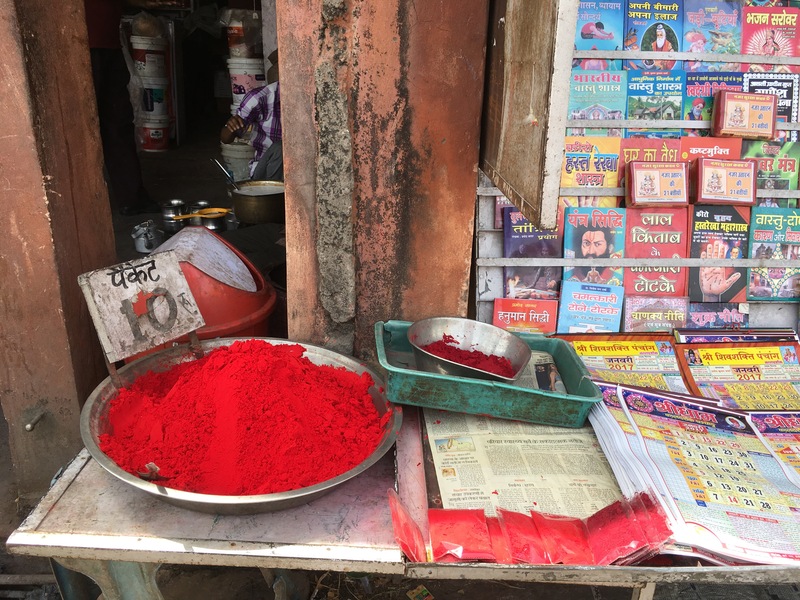 Emma and I drink Coca Cola in cold glass bottles with an Indian vendor in the shade of his quiet rooftop shop, where we sort through painted carved elephants and bright chunky turbans and slippery silk blouses. The city is painted pink, and I’m falling in love. On the Tuk Tuk drive back to our hostel, we stop at a red light and a boy, maybe seven or eight, wraps his arms around the metal frame, holding out one open palm and miming the taking and eating of food. His hair is sandy from white dust and his eyes are dark brown. Our Tuk Tuk driver shoos him away and the light turns green. 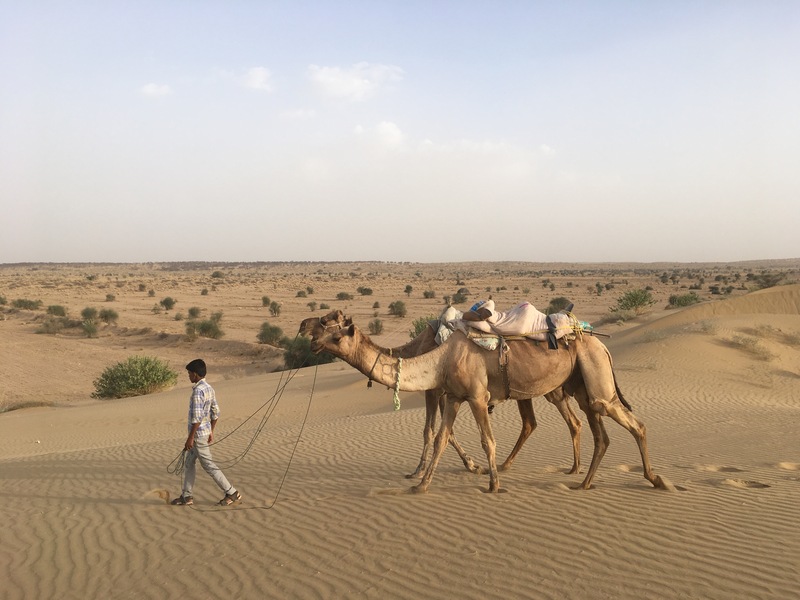 India is enormous, and another twelve hour overnight train ride west takes us deep into the Rajasthani desert town of Jaisalmer. We arrive at 5 in the morning, when the desert is still dark and quiet and breezy. 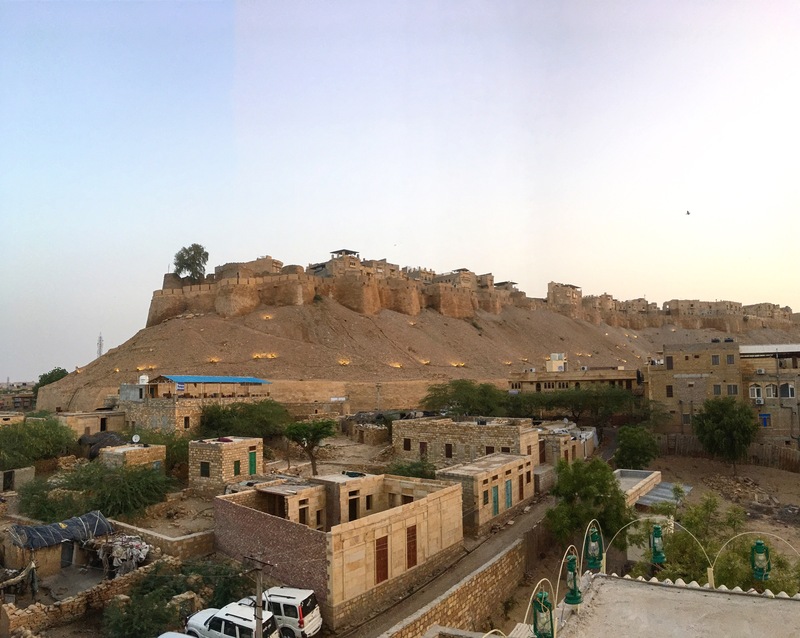 Manu, the young man who runs the hostel, greets us at the front door and whisks us up three floors to the open air rooftop, where we watch the orange sun rise over the 12th century brown stone fort on the hill. We eat buttered toast and omelettes and drink milky brown chai. Below us, men and women sleep on flat roofs. They are cocooned lumps in thick mattresses and ratty blankets. Manu sees me staring at them and says, “India is incredible. 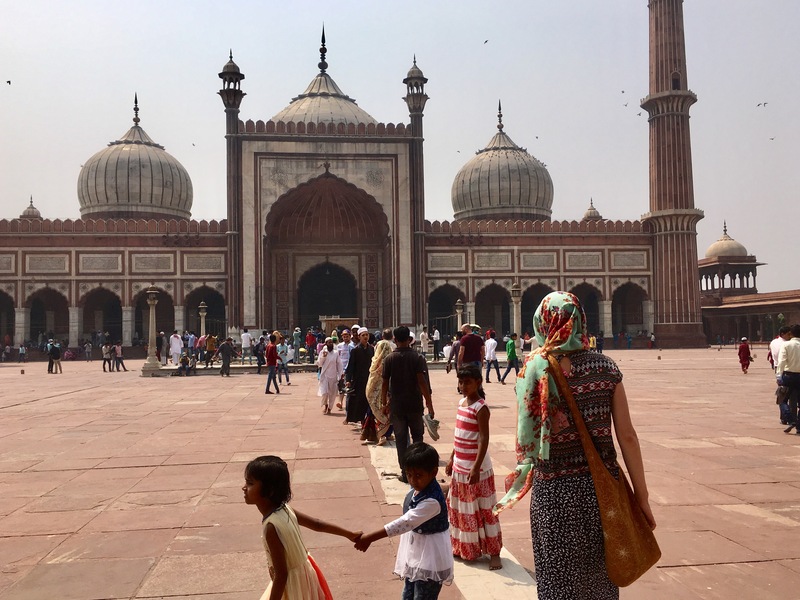 You can see anything in India.” We stay up there until it gets too hot — which isn’t long once the sun is up — and then we fall into our air conditioned room and sleep off the sleepless night. 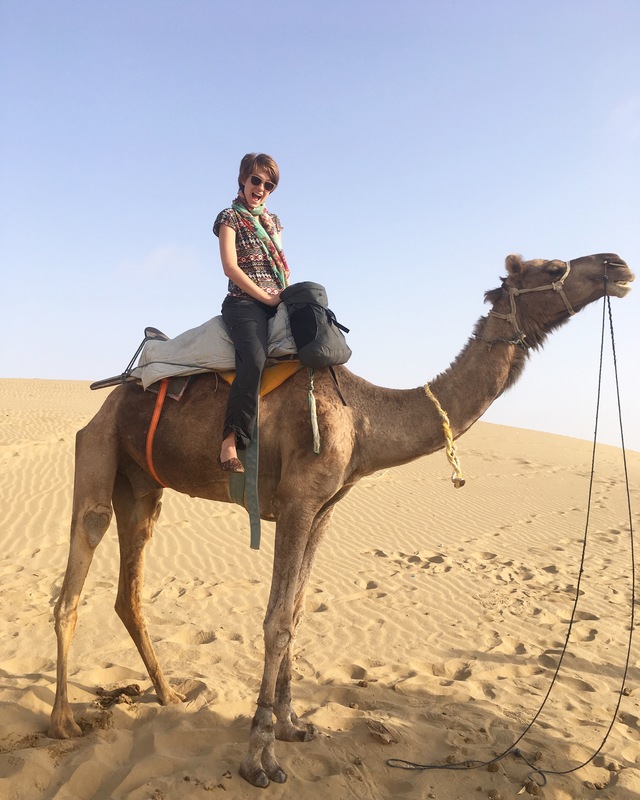 We’ve come to Jaisalmer for a camel safari. Emma and I first heard about these safaris when we were in Nepal, and immediately knew we had to go on one. In the late afternoon, we climb into the back of Manu’s rusty jeep and head further west, into the desert. The sun is a hazy circle of fire in the sky, the air hot and dry, the gravel road bumpy. Manu gives us both cold water bottles, and I press mine against my bare belly, the side of my neck, roll it between my hands. 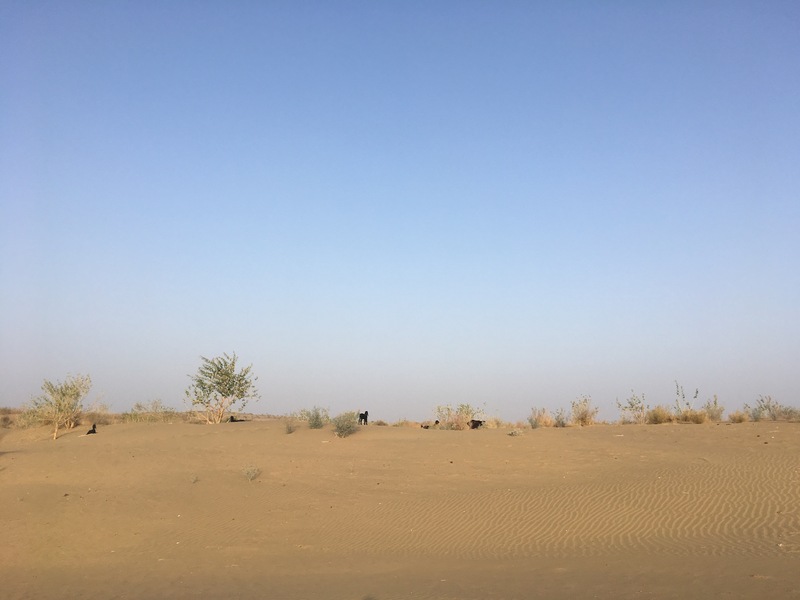 We zip past cacti the size of trees and start seeing the camels, standing about listlessly in the sun, staring at us smugly from the side of the road, plucking the leaves from desert oaks, sleeping with their long necks folded into the sand. I get a quick thrill when Manu tells us we are an hour’s drive from Pakistan. Once again, we are far from home. 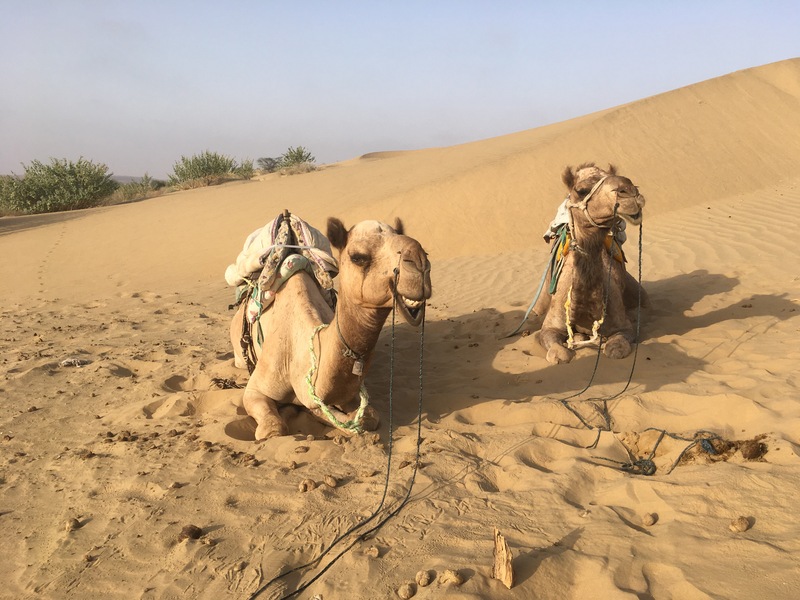 Raju and Doola, our camels, are waiting for us at the camel point, a small sandstone village where camels with ropes around their front feet drink muddy water from a stone tank and chew cud with the mangy dogs running circles around their long legs. They are gangly, all knobby knees and fuzzy humps and skinny necks and floppy lips. When I climb onto Raju’s back, he lets out a primordial growl that reminds me of a dinosaur. These creatures are ugly and temperamental; they are also resilient and strong. They carry us in the triple digit heat out onto the sand dunes. The eight-year-old me who always thought camels were cute squeals with joy on the inside even though the ride is hot and uncomfortable, and soon my legs are sore. The desert is pleasant once the sun sets. 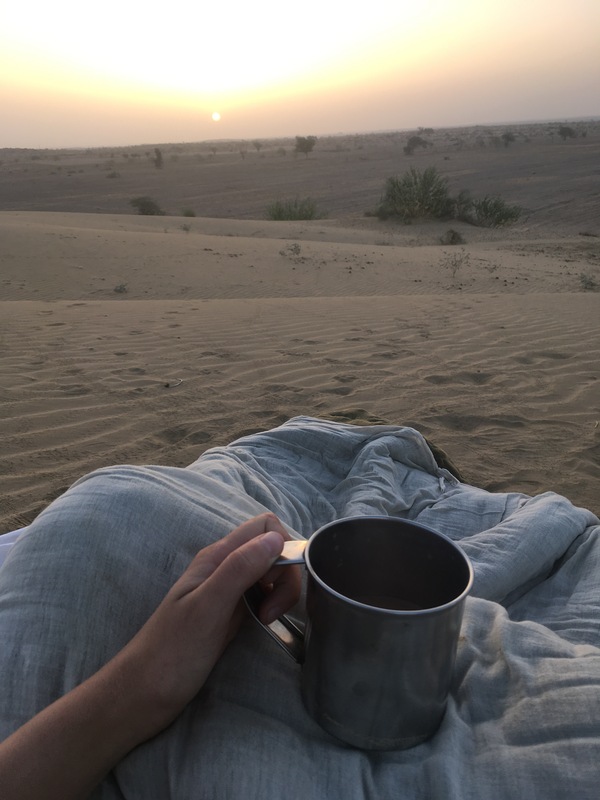 We drink chai from tin mugs off a platter on the dunes, watching the sun fall. In the distance, I hear the sound of Doola’s bell clanging as she chews her cud. Below us, a camel man and a camel boy cook curry and rice over a fire. Stray dogs lie on the sand, watching and waiting for a chance to steal our dinner. Manu sits with Emma and me in silence as the desert grows dark and the first stars appear. There, shining bright is Jupiter. And there, so comforting because I can always see it at home, is Orion’s Belt. We sit on a coarse blanket by the fire in the dark and eat our meal as the fat black beetles scramble across the sand. Manu and the camel man set up cots padded with thick mattresses up high on the dunes. We drink ice cold Kingfisher beers as he and the camel man serenade us with Rajasthani renditions of “Barbie Girl” and “Buffalo Soldier” and a sad song about an Indian woman who is getting married and must leave her family for good. We ask Manu questions about life in India, and he tells us there is no dating here, which is very hard. “When women don’t have power, men don’t have power,” he says. He tells us he will marry a foreign girl. 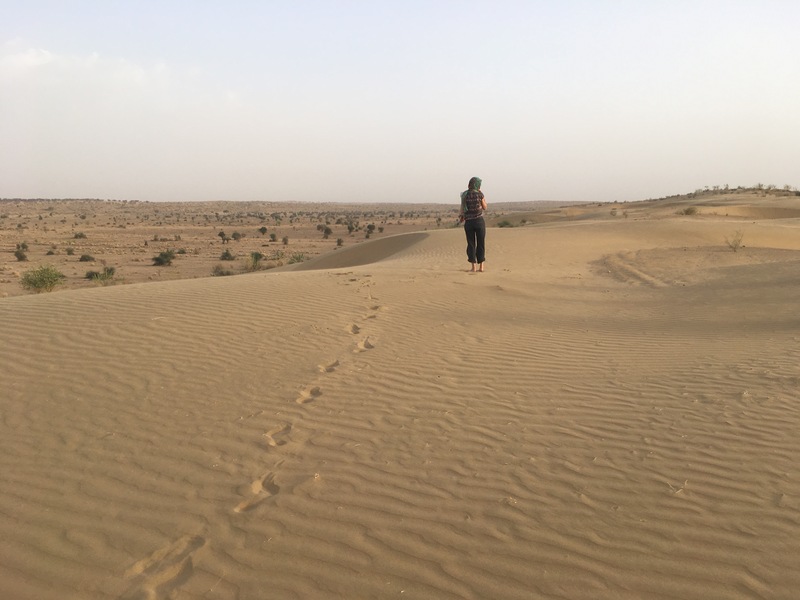 He tells us he wants to travel, but Jaisalmer is as far as he’s ever been from his village of three hundred people near the Pakistani border. He wants to see the beaches of Goa, maybe, or the mountains of Nepal. Now that he’s no longer a camel man, but works for the hostel, he can save up money. He tells us all this in perfect English, which he began learning only two years ago. That night, I count six shooting stars and send my wishes up to God. I see lightning flash along the horizon. I feel the cool breeze off the dunes and bury myself in my blanket. I fall asleep, and when I wake a few hours later, the Milky Way is a white river flowing above me. I feel so close to the sky, the dome above, it doesn’t seem real. When the sun rises, the birds chirp and an eagle soars right above us. Far out in the flat desert below the dunes, I see Raju and Doola sleeping with their heads up to the sky. India: I see, but I don’t always understand. And I see so much. We walk the back alleys of the bazaars in Old Delhi, and it is stepping around doves and pigeons crammed in flat metal cages, children pumping brown water into a bucket from a rusted pump, women in bright patterned saris with gold rings in their noses who stare at our pale skin, men driving green and yellow Tuk Tuks pulling up and calling out, “Spice market? Red fort? Very cheap!” It is tattered colorful tarps strung over piles of trousers, T-shirts, and flip flops. It is heaps of corroded electrical parts and trash strewn about the ground. It is vendors selling sharp smelling oranges and cold fresh-squeezed lime juice and bunches of bananas on a wooden plank. It is the heat, relentless and full, and the sun ever shining. It is cows lumbering idly, eating scraps from metal bins. It is the smell of sweat and urine and exhaust, and then, suddenly, spicy curry. A man dressed all in white beckons us into his crowded restaurant, and in a steamy booth crammed upstairs beneath a rickety fan, we tear apart chunks of freshly baked roti and dip it in hot curried vegetables. We lavish praises over this fabulous meal, which will cost us each less than fifty cents. Loudspeakers on the minarets of the Jama Masjid Mosque, one of the largest in India, echo forth the call to prayer. I wrap my floral scarf around my head and follow the mass of people up the stone steps. Below me, Old Delhi is tin roofs glinting in the sun and dust and smog billowing upwards, horns honking and thousands of people clambering over each other in a mad rush to get where they have to go. 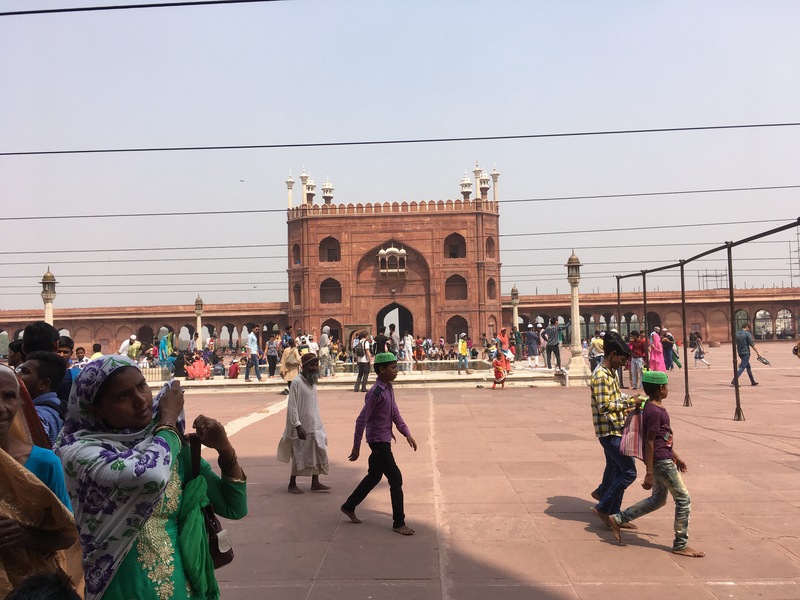 We sit in the shade of the mosque and Indians approach us, asking, “Photo?” Or they don’t ask at all, and sidle up for a selfie. A little girl in a white and purple chiffon dress prances back and forth in front of us, smiling and laughing. In all my traveling, this time and the times before, I have never felt farther away from home. We would be lost without Shabhu. Or at least, navigating Agra would be much more difficult. 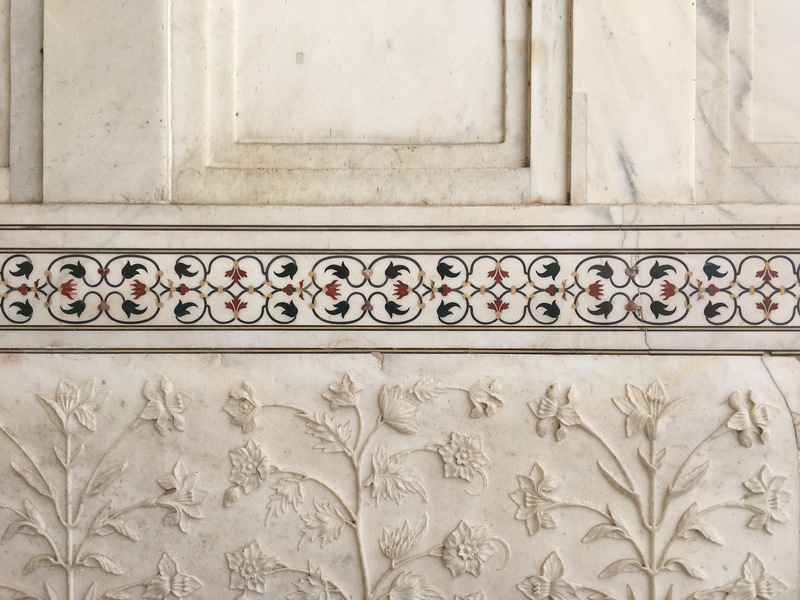 When the train from Delhi pulls into Agra, we look for a Tuk Tuk to drive us to the Taj, and Shabhu, mustached and skinny, in a pressed yellow shirt and clean white pants, steps out of the crowd, beckoning for us to follow. “Welcome to my Indian helicopter,” he says, helping us into his green and yellow Tuk Tuk. It is spotless, inside and out. For 500 rupees each, Shabhu will take us around Agra for the day: the Taj Mahal, the Black Taj, the Agra Fort, a traditional Indian lunch. He shows us his guest book, where tourists from around the world have written recommendations. We look at each other, tired and hot, and put our trust in Shabhu. He does not fail, and within half an hour, we are walking through the main gate of the Taj. We can see her marble base through the dark entry. She is more beautiful than I ever imagined she would be. All the hype: it’s true. She stands tall and magnificent in the sun, a marble testament to love. We walk around her, touch her cool side, look in wonder at the inlays, florid curls and wisps of vines and words carved in a language secret to us. Next up, says Shabhu, the Black Taj. He explains meticulously what this Black Taj is, with one arm draped over the back of his Tuk Tuk, the other shooing away a child who comes up to ask, “Chocolate?” But in his thick Indian accent, we don’t understand what he says. We catch words here and there, phrases occasionally: “black marble shipped by boat from Italy”, “too expensive”, “money given to the poor.” We ask questions for clarification, but still don’t understand, and in the end, let him lead us down a quiet, dusty road toward a booth, where we shell out 200 rupees and enter a hot garden where orange blossoms drip from shimmering green trees and the sun bakes our skin. 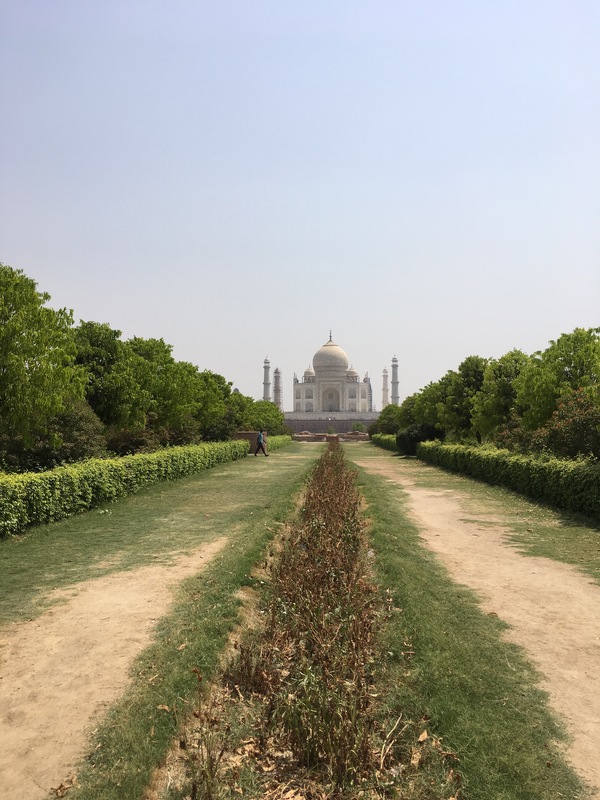 We see the Taj Mahal again, this time from across the river and without the throngs of tourists and whistling guards. We see a pile of old red brick ruins. We see a cow with a large metal bell clanking around its neck gallop along the shore. We whisper earnestly to each other, “Where is the Black Taj?” We want to see it, this dark mirror of the mausoleum across the way. As it turns out, the Black Taj does not exist. We look it up on our iPhones and find it is a legend made popular by the “fanciful writings”, according to Wikipedia, of an obscure British writer. In other words, we paid to see the supposed location of a mausoleum that was never built and may never have been planned. We return to Shabhu and he takes us to a lunch of mushroom masala and fried rice and lassis. Once again I think, I’d come to India over and over again just for the food. 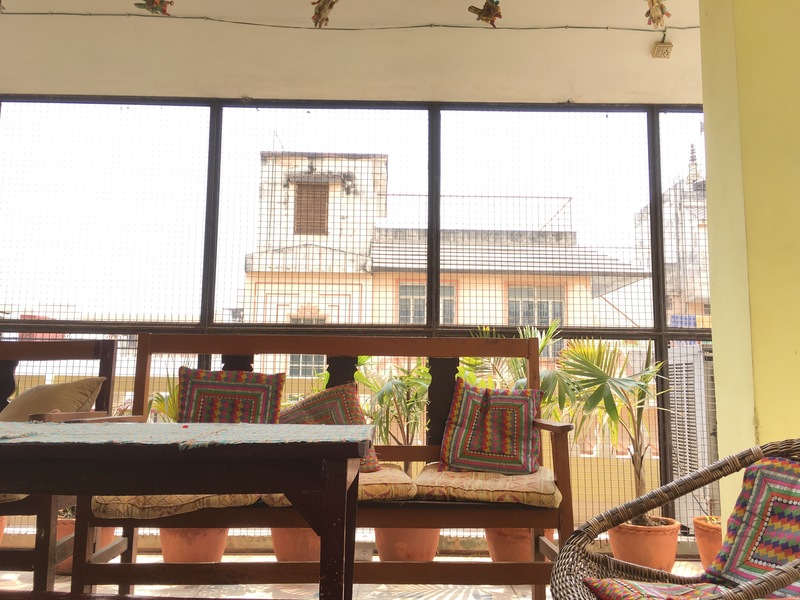 I find a book on Hinduism in our hostel in Varanasi, and flip through the pages on the rooftop terrace, lounging on colorful cushions and plush pillows beneath a fan that stirs the hot air. It is 106 degrees, and I fall asleep reading, the heat filling me until I am a heavy weight that could lie there forever. India is 80 percent Hindu, and Varanasi is the holy city on the banks of the holy river, the Ganges. 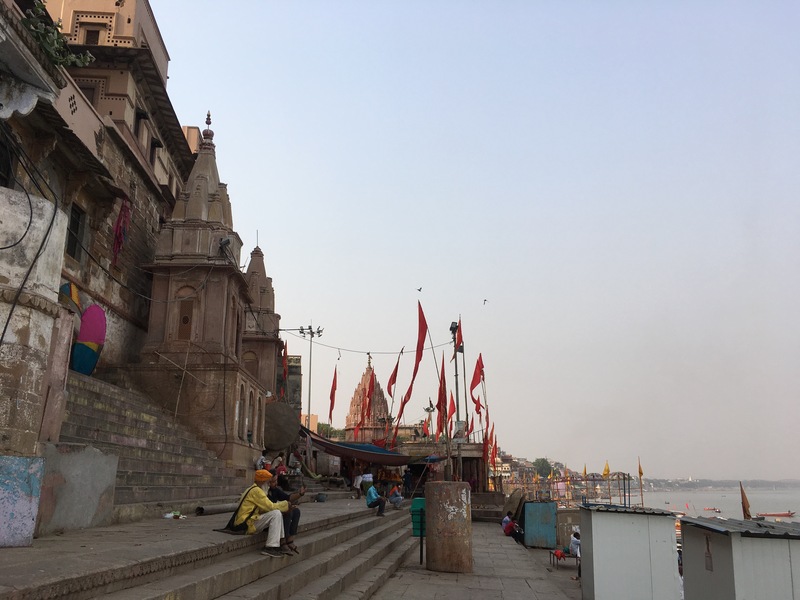 Later, we wind our way through the narrow, bustling streets until we see the ghats, the steps leading down to the river, and the green water of the Ganges herself. We walk along the concrete embankments, and see the smoke from the cremation fires and the holy men in their matted dreads and saffron-colored sashes and the wooden boats with their orange and pink and yellow flags flapping gently in the wind. Young children splash about in the water. Old men lather themselves with soap. Young men come alongside us asking, “Boat?” Women selling bright yellow marigold flowers and candles in silver trays to float in the river hold up their baskets for us to see. Water buffalo, huge and slick, lumber out of the river and barrel past. Looking absently this way and that, we see a dead body wrapped in cloth and swarming with flies in the trunk of a truck. 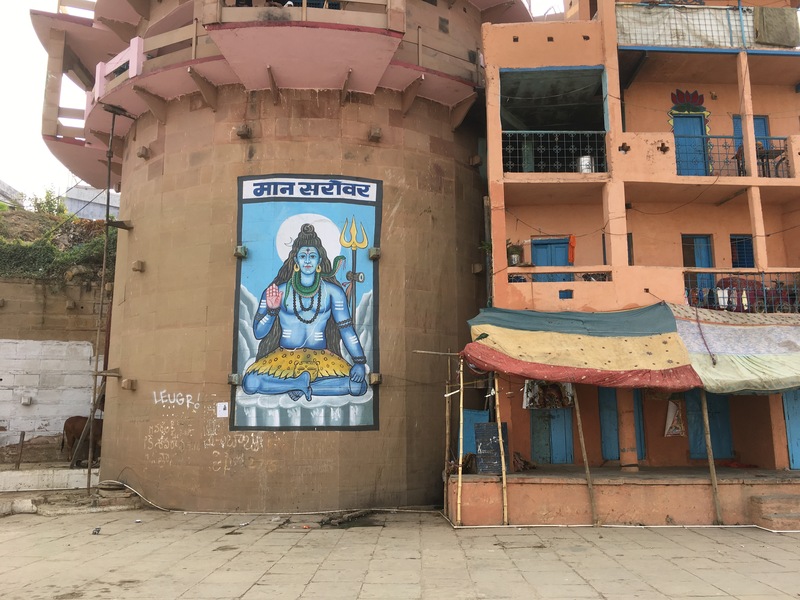 “Varanasi is life and death together,” an Indian man tells me as we look out over the river, and I feel like I’m witnessing something important, something vital that I don’t understand, that I am separate from, that is closed off to me. Holy men with ash smeared on their bodies smiling and waving, a child with a lame foot leaning on a wooden staff disappearing down a narrow alleyway, an Indian man telling me, “Go to the burning ghats now to see the bodies. It is very lucky.” Crumbling red and mute brown stone temples, metal vats of square white paneer, the sweet smell of yogurt and so many flies I cannot breathe for fear of inhaling them. The surprising flick of a cow’s tail on my hand. A little boy diving gracefully into the water, splashing me as I leap back. In the late morning, we walk along the ghats until we find a spot beside a few bobbing boats where a boy is swimming and washing his clothes. I take off my shoes and step ankle-deep into the cool water. The concrete is slick with moss, and I don’t think about what else. Upstream, another boy rides a water buffalo while men who’ve just taken a dip squat in the shade playing cards. As the water laps gently at my feet, I try not to think about the bodies dropped ceremoniously in the center of the river and the 80 bodies a day cremated on its shores. I don’t think about the ashes. I don’t think about how the Ganges is the second most polluted river in the world. I don’t think about my sins being washed away or good luck or pleasing Shiva. I stare out at several new friends from my hostel who have gone in all the way, and I feel confused. At peace, yes, but aware that I’ve stumbled upon a place that is so different from me, a beautiful place that ignites my imagination and jolts me out of myself, but a place that feels far away even as I sit with my feet in the middle of it. In the evening, we wind our way down the streets from our quiet, air-conditioned hostel to the ghats. The river is a hazy blue, and a soft breeze blows across the water. 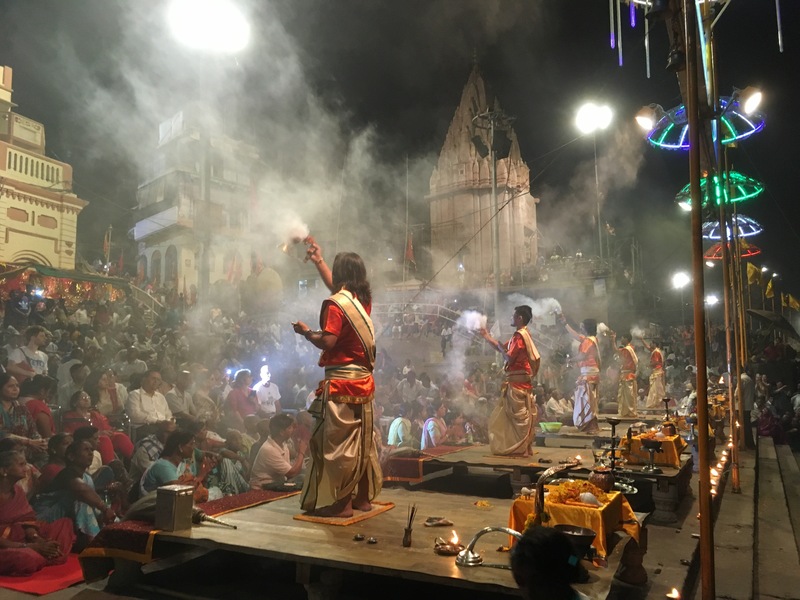 Every evening at 7, there is a ceremony called arati on the ghats, a ritual of worship to the river and the god Shiva, and a prayer for mankind as a whole. We reach one of the main ghats and find the water just off the shore crowded with wooden boats full of Hindu worshippers come to see the ritual. Some light candles and send them floating off into the dark. Many more crowd the steps leading up to a platform, where bells clang and men in brilliant orange sing, burn sticks of incense, wave huge gold cups shaped like serpents filled with fire, and toss petals of marigolds into the air. One of the men in orange speaks in Hindi into the microphone at the dense crowd, and I ask an Indian fellow who accompanied us from the hostel what is being said. I expect something profound, something highly holy, but instead, it turns out the man is simply instructing the crowd to watch their belongings and to speak with the administration if they would like a ritual performed in honor of themselves or a family member or a loved one. 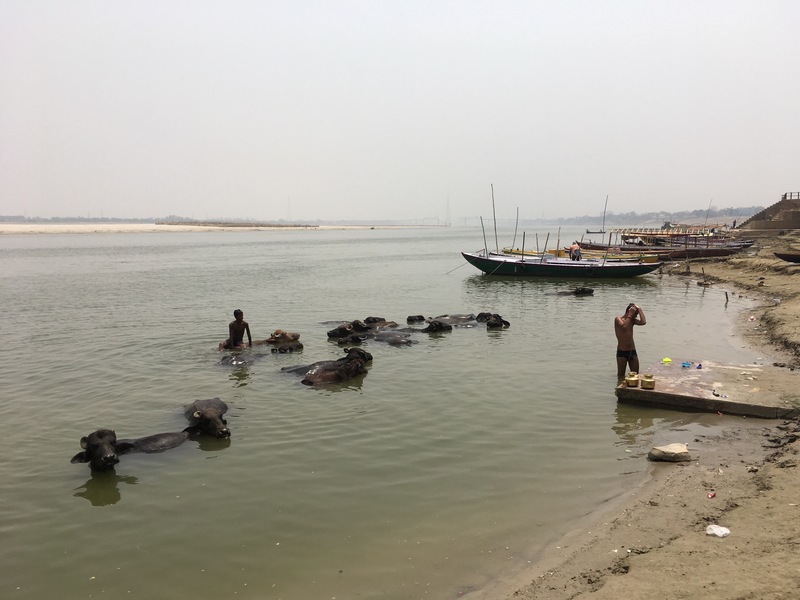 And suddenly, on the banks of the Ganges, seated beside an Indian man with the mark of Shiva on his forehead and several old women wearing saris and a gazillion sparkly bangles on their wrists, I break through a barrier to familiarity. This enchanting, colorful ritual may be unusual to me, but the aim is the same as any ritual I’d see at home: prosperity, health, and happiness for us all. As a man walks around jotting down requests for the ritual on a pad of paper, I’m reminded of prayer request cards at the backs of the pews in my church at home and the prayer teams available during communion. So much of the form of this religion is different than my own, but the desires in the hearts of these people are the same. For a moment, as clouds of sweet incense billow over my head and the bells clang and the music arches into the night sky over the water, I am moved on the inside, and my heart gives a little flutter. On the way back, the river is quiet again, and we pass the fires on the burning ghat near our hostel. I hear children laughing and playing cricket in an alleyway. I see a mother and father and baby step out of a pharmacy and climb onto a motorcycle. I see a body wrapped in saffron cloth and a man in a matching tunic waving incense over it. I see two mad dogs going at it in the street. And I think, this religious city is a living metaphor for all of humanity, for the mystery of birth and growth and death, and everything therein. When I was a little girl, about eight or nine years old, my parents bought me the computer game Where In the World Is Carmen Sandiego? The game, seemingly rudimentary now, but enthralling to a child in the 90s, was educational, meant to teach rapt children like myself basic geography through the virtual hunt across the virtual globe for the notorious, glamorous criminal in the sweeping red hat. 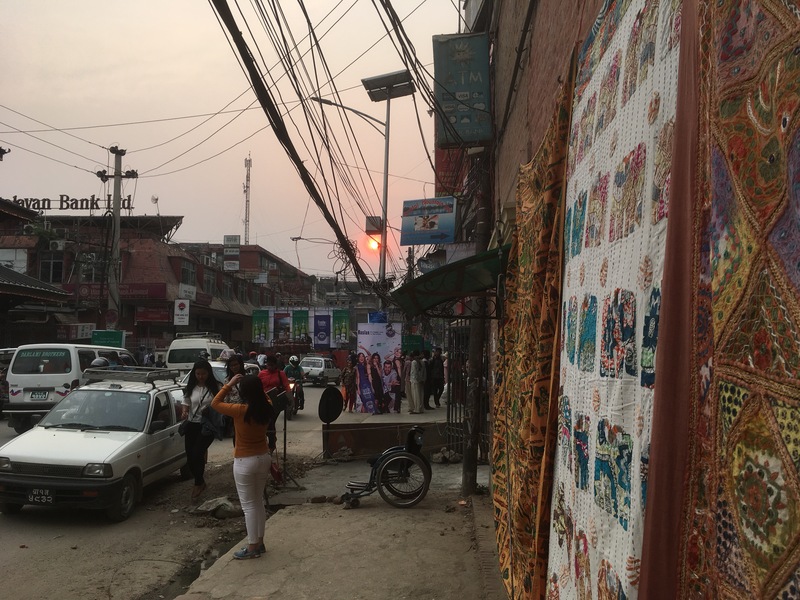 Oddly, nine times out of ten, Carmen seemed to wind up in Kathmandu, a glitch in the game, perhaps, or maybe an intentional set up by the designers to teach young Western gamers the locations of seemingly exotic, distant countries like Nepal. Certainly Kathmandu seemed excessively foreign to me. Even the name, “Kathmandu”, sounded rather like “Timbuktu”, and I conflated the two far off cities in my mind, my only context for either the cliche phrase I’d heard on occasion, “That’s as far as Timbuktu!” Like many others (adults and children alike), I didn’t realize Timbuktu was a real place, and so Kathmandu was equally mysterious and inaccessible to me. Apparently, interactive educational computer games are an ineffective method for teaching geography, because I remained ignorant of the location of Kathmandu, as well as the location of Nepal itself, until I was an adult. Neither the city nor the country crossed my mind much again. That is, until a friend from college invited me to join her in Nepal for six weeks, flying, of course, into Kathmandu. My mind flickered back to the vague memories from my childhood of Carmen in her striking red coat, glossy wavy hair, and bright smirking lips, standing on the dirt streets of that remote city, and my wistful imagination began to stir. Was there anywhere more remote than Kathmandu? Anywhere more different than where I was then, living in the middle class suburbs of Dallas? 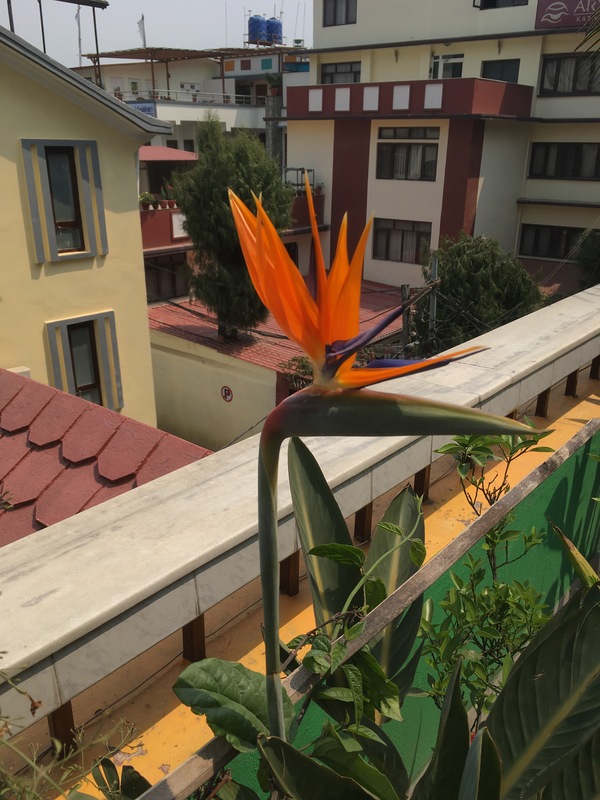 I booked my flight in less than a week; a few months later, I was on my way to Kathmandu. 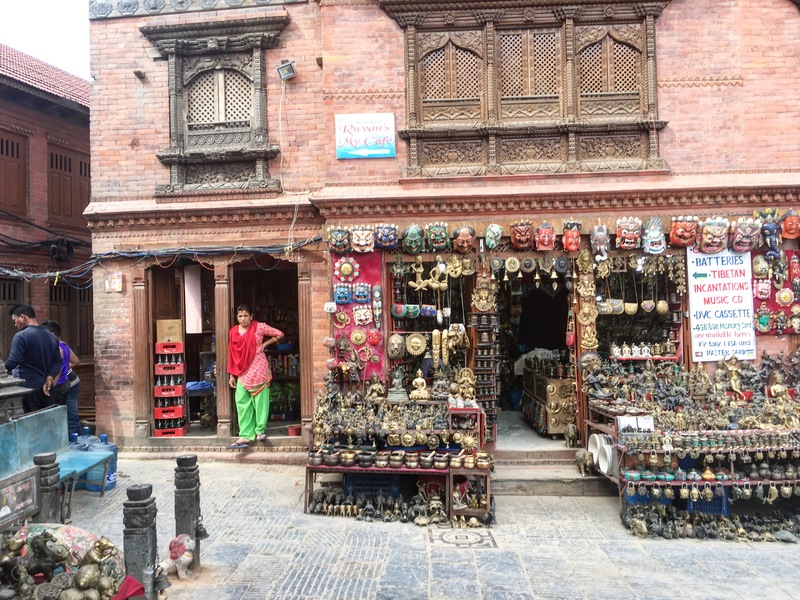 In the beginning, Kathmandu felt as exotic as I’d imagined it would. 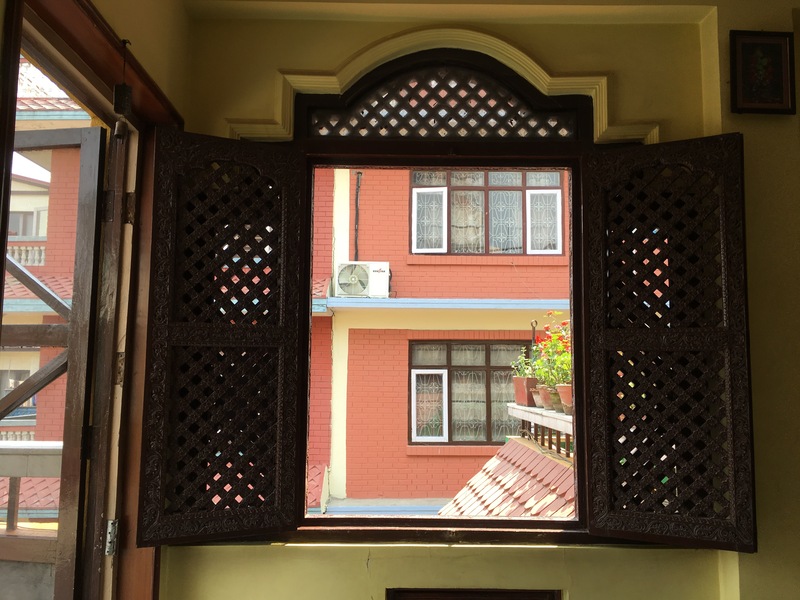 My friend and I stayed for the first few nights at The Hotel Ganesh Himal, a quiet spot with a pleasant garden just a few minutes walk from the tourist district, Thamel. 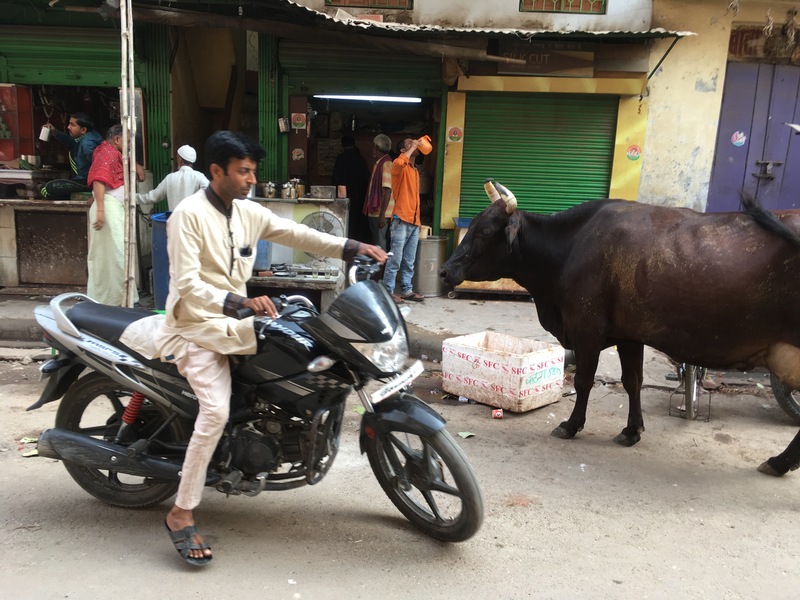 That first night, we went out into the cacophony of motorcycles, small white taxis, faded maroon and gold rickshaws, and torrents of masked pedestrians, in search of a cheap spot for dinner. 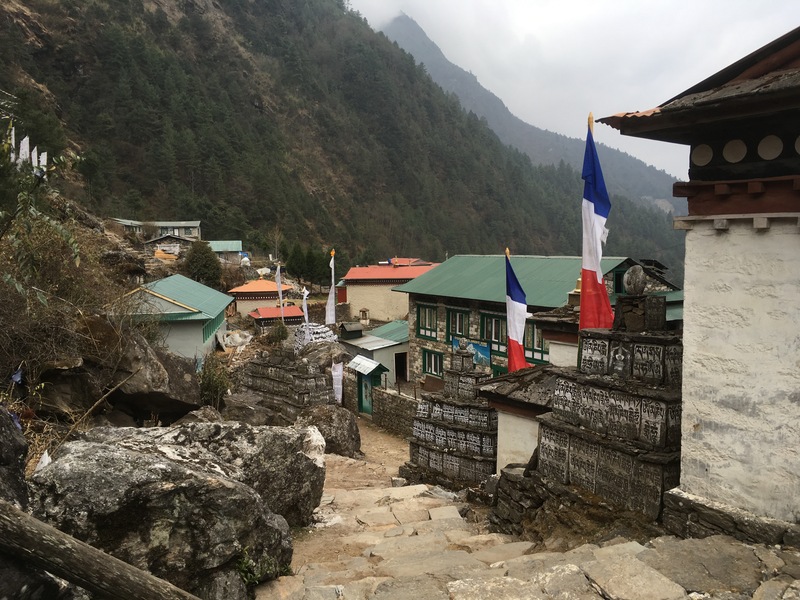 We found one on the roof above the shops (and the dust and the smog), and ate our first meal of curried vegetables and plain white rice, raving about it beneath the soft flutter of prayer flags and the brilliant white stars. In our excitement to see the city (and partake of its delectable foods), however, we’d failed to pay much attention to where we were going. When we left that rooftop restaurant, our bellies satiated and our hearts full of the satisfaction that comes from a good conversation with a good friend, we found ourselves utterly, horrifyingly lost. My friend, who’d been traveling across Southeast Asia for the last two months, had a bolder willingness to weave across the narrow streets, dodging motorcycles and taxis and rickshaws that have no ability to discern the difference between hitting a bump in the road and running over a pedestrian’s foot, so she took the lead. I was happy to let her. But no amount of courage and experience was a match for the labyrinth of dusty alleyways and tangled power lines and neon lights that make up the confused streets of Thamel. We walked and walked and walked, down this street, then that, then back down the same street as before because we’d walked in a circle. Vendors rolled shut their metal doors, closing their friendly shops from us. Tourists in flowing elephant print pants and stiff hemp shirts faded into the intricate maze of rooms in the crumbling stone buildings above. Block by block, the lights of the city shut off, leaving us in complete darkness. When a taxi rumbled past, its headlights shone like an eerie kaleidoscope through the thick dust onto the rickety wheels of a rickshaw cycling away. Nepali men hung about the street corners, smoking and muttering to one another in the dark. I felt disoriented, afraid. I felt like I was in a film noire, and possibly the pretty but silly girl in the opening scene of suspense who doesn’t make it past five minutes. We flagged a taxi, but the driver didn’t know The Hotel Ganesh Himal. We stopped a skinny rickshaw driver who pointed in the direction we’d come from and said the hotel was that way. 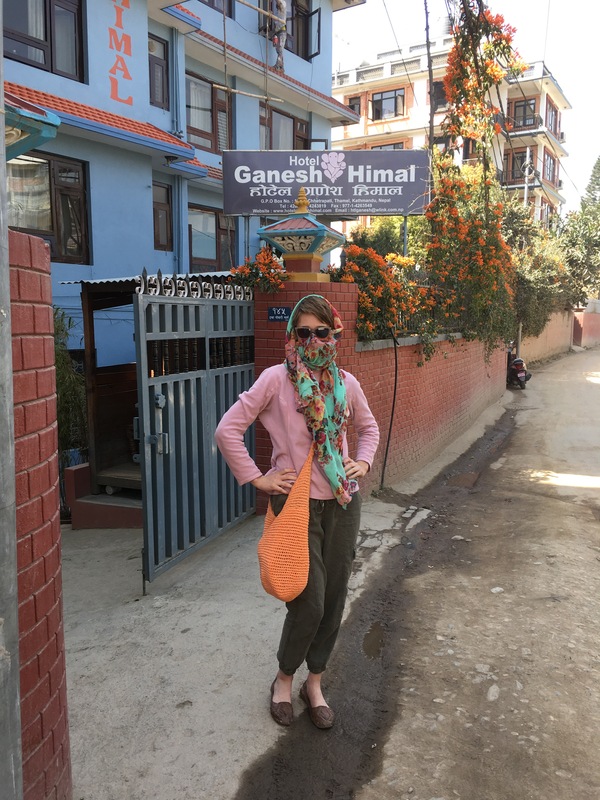 We found a faded brown sign that actually said Hotel Ganesh Himal, but the arrow underneath it could have been pointing down three different side streets, and we didn’t find our hotel on any. In a final state of fear, me thinking we’d have to curl up on the dirty doorstep of a shop with the mangy stray dogs for company, we stopped a last rickshaw driver on his way home. Yes, he knew the hotel. Yes, he would take us, for 200 rupees. I would have given him a thousand just to get us off the street, but my friend’s cool head prevailed. It’s so close, she said. How about 100? 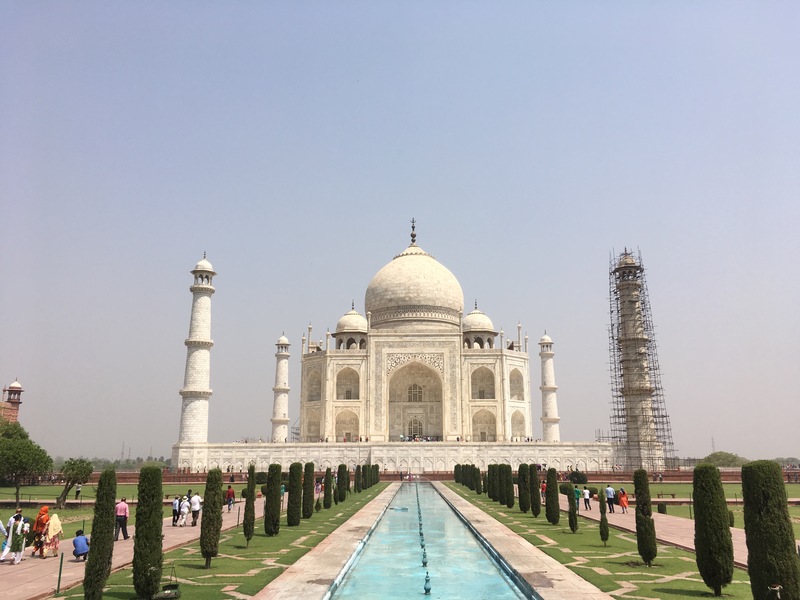 It was close; less than two minutes later, he dropped us off in front of the small blue statue of the Hindu god Ganesh, a pudgy elephant with a decorous crown, and we tumbled inside the safe, softly lit lobby. I laughed because it was better than crying. Where are we, I asked my friend? We were pretty much exactly on the other side of the world. 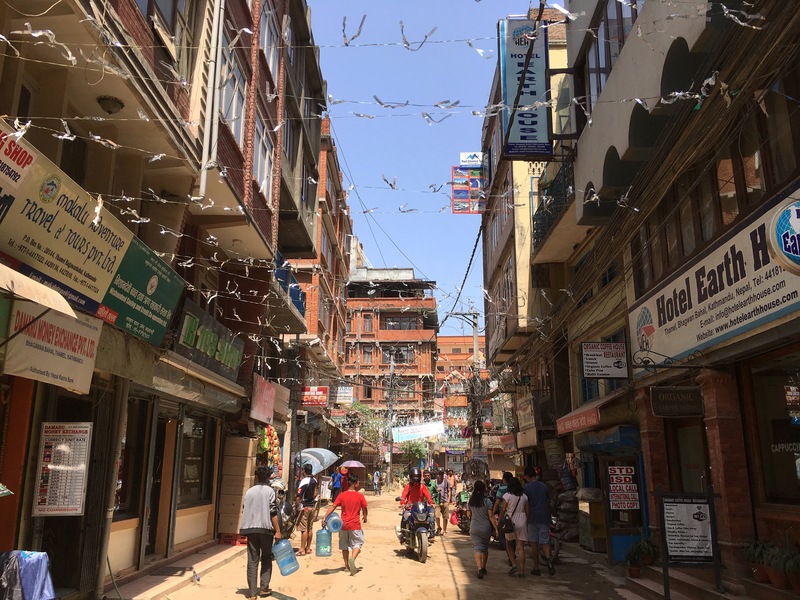 In my mind, the other side of the world ought to be unusual, uncomfortable, perhaps a bit bizarre, and at first, Kathmandu lived up to those expectations. 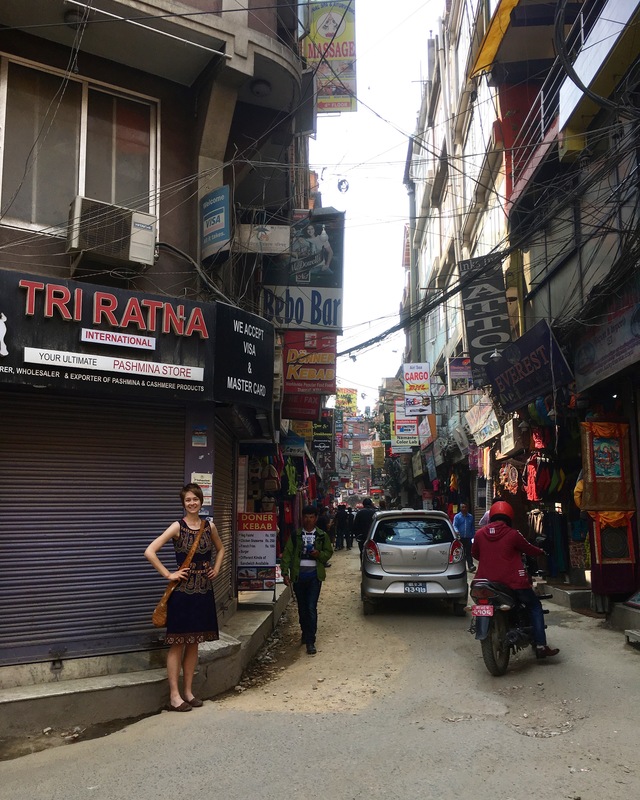 My friend and I walked around Thamel, where young Nepali men called out from the front of their stores, which overflowed onto the dusty streets with gold singing bowls, turquoise teapots from Tibet, plastic wrapped packets of prayer flags, and lots and lots of hippie pants. “Hello, sister!” “How are you?” “Where are you from?” Catch the eye of one of these vendors and next you would hear, “You like? More colors inside.” Or, “Welcome, madam,” along with a gesture into the musty shop. Or perhaps a simple, courteous, “yes, please,” as if buying that 100 percent yak wool scarf would be a favor, not a transaction. In other words, it was living up to its exotic reputation. And perhaps Kathmandu would have retained this exotic veneer if we hadn’t then moved into the Alobar1000 Hostel on the other side of Thamel. 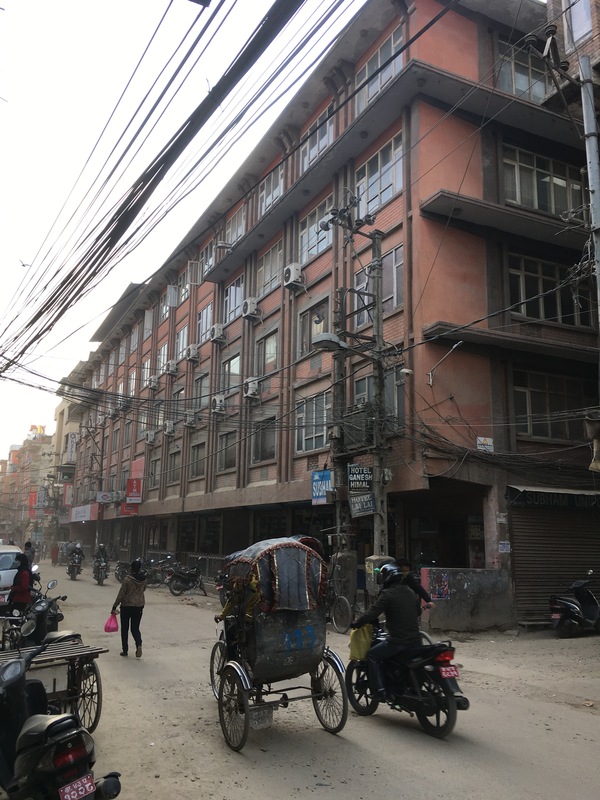 This hostel, one of the most popular in the city, was a four story maze of dorm rooms with hard bunk beds, balconies laden with crumbling terra cotta pots, and a breezy open rooftop where young Western travelers laid about on lumpy cushions smoking, drinking Everest beers, and eating fried momos. Most of these travelers were in their twenties, and almost all were on monthlong trips across Asia. Most had a number of fabulously intricate tattoos, quite a few purchased right there in Thamel. Most wore flowing hippie pants, long beaded skirts, or floral scarfs they’d also bought in Thamel. Almost all were either coming from or heading to one of the treks in the Himalayas, attending a 10-day Vipassana meditation retreat, or volunteering at an orphanage, organic farm, or village struck by the 2015 earthquake. And through their eyes Kathmandu began to look familiar. Western style restaurants, like OR2K, where you could order Mediterranean food served by hipster Nepalis underneath trendy neon lights, were recommended as the best spots to eat. Spending the evening drinking rum and coke at a hazy bar where an 80s soft rock band played was an evening well spent. Drinking to-go Americanos bought from the clean and bright Himalayan Java might have felt like drinking a taste of the real Nepal — except the shop was secretly owned by Starbucks. 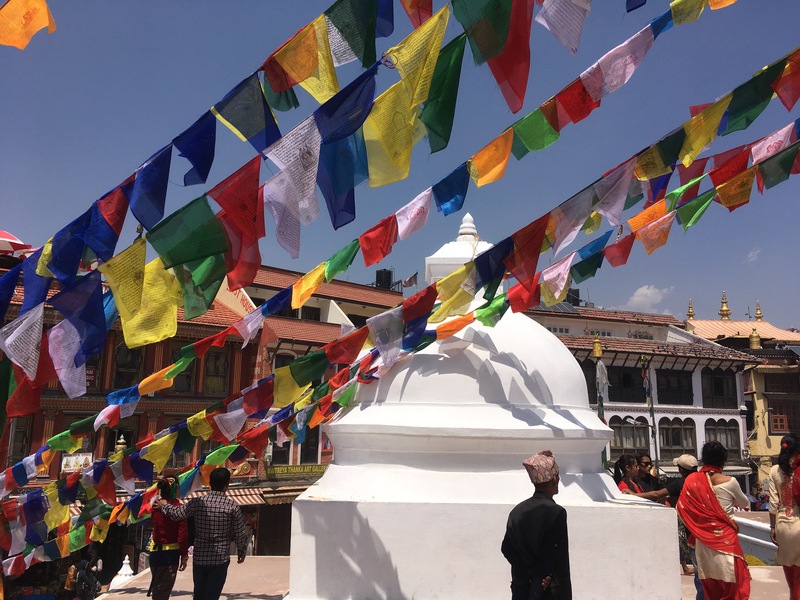 Seeing Kathmandu through the eyes of these free spirited millennials, the remarkable suddenly became commonplace, and Kathmandu felt little different than a Westerner’s playground. 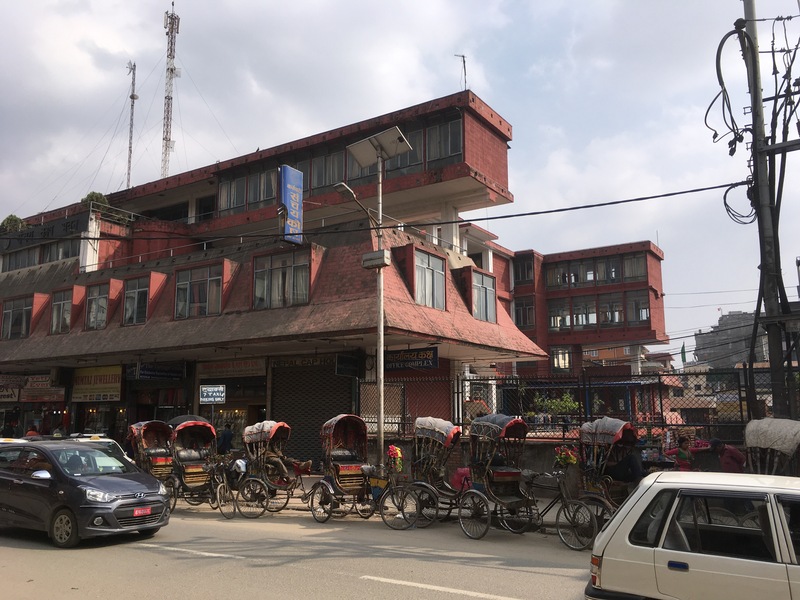 Oddly, I began to feel as if I connected more with the Nepalis I met on the streets of Kathmandu than the Westerners in this hip hostel. I was wary of what appeared to be their somewhat empty approach to travel: the sense that each city, each country, each trip was another check mark off a list of cool places to go, an adventurous story to collect, perhaps, but nothing more. Don’t get me wrong, the urge to travel took root in me as well, and soon I too was dreaming of visiting ever far off lands — Laos, Cambodia, Vietnam, Bali. In fact, I wondered if my dislike for this approach to travel was because it was awfully close to my own. Traveling is addictive, and my list of places to visit began to grow. But this list also felt frivolous, and a little sad. Missing was a sense of commitment to other people, to a physical place, to a mission unique to one’s own. The Nepali people, on the other hand, though culturally quite different from myself and my compatriots, made more sense to me. 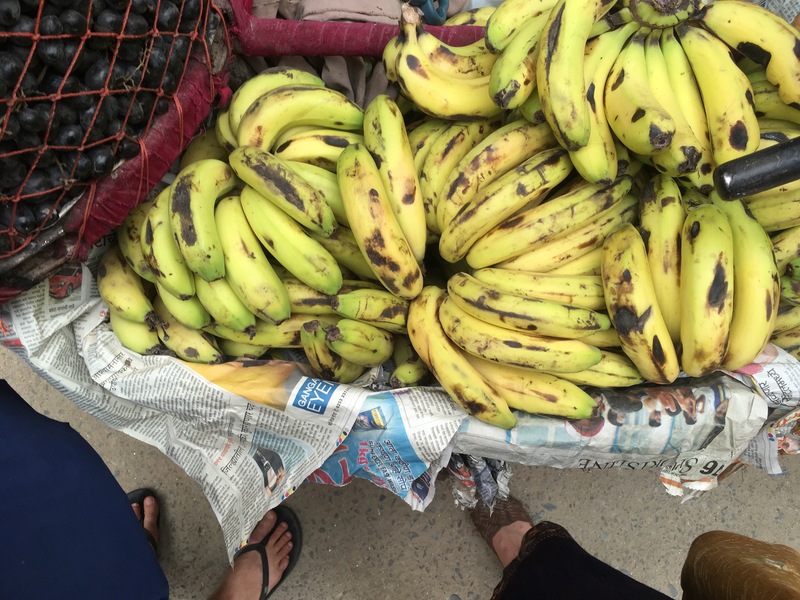 While I didn’t know (and likely never will) what it’s like to sell bananas and pomegranates and apples from a large basket on the back of a bicycle, I understood the motive and intention of the Nepali vendors who called out to me, “Fresh fruit. Bananas. Apples. Fruit juice.” The vendors may have slyly snookered me into buying twice as many bananas as I wanted, but I understood and respected their goal: this was business plain and fair, and the result was money in the pocket and another hard day’s work done. I found myself having more respect for these hard-working Nepalis than myself or any of the beautiful, free and easy Westerners I met on the road. And yet, just when I thought I was connecting with the Nepali people, I walked past a child on the street, a little girl maybe three or four, dirty and begging on a tattered purple blanket; I saw whole families washing their hair from a hose sticking out of the ground; I saw an elderly woman, her back as crooked as a hanger’s hook, ringing a bell beside a shrine to Ganesh. And I remembered: this culture, and by extension, these people, are foreign to me. As my friend aptly put it, we don’t want to be tourists when we travel, we want to be connected to the Nepali people, to live like they live, but at the end of the day, we will always be Westerners, we will always be tourists. We might as well embrace it. So embrace it I did. I bought two pairs of hippie pants, one blue with white elephants, another pin-striped. I swapped trekking stories with a traveler from Germany over black tea and yogurt while sitting cross legged on the hostel floor. I frequented the hostel’s popular watering hole: Western Tandoori, where Nepalis churn out dirt cheap roti and Chana masala so spicy it will make your nose run. I opened myself up to the gentle vulnerability of the roommates in my 12 bed hostel dorm, and found myself warmed inside and out by their compassion toward others and their zeal for life. And late at night, though the hostel played Justin Timberlake and Eminem like a proper Western radio, I could also hear the mad dogs barking and smell the sweet incense burning on the street, and I remembered that I was here in a city so far away from my familiar world that the notorious criminal Carmen always went to hide. Just when you think it’s over, the mountains try to kill you again. Emma and I are ecstatic to make it to base camp at last. 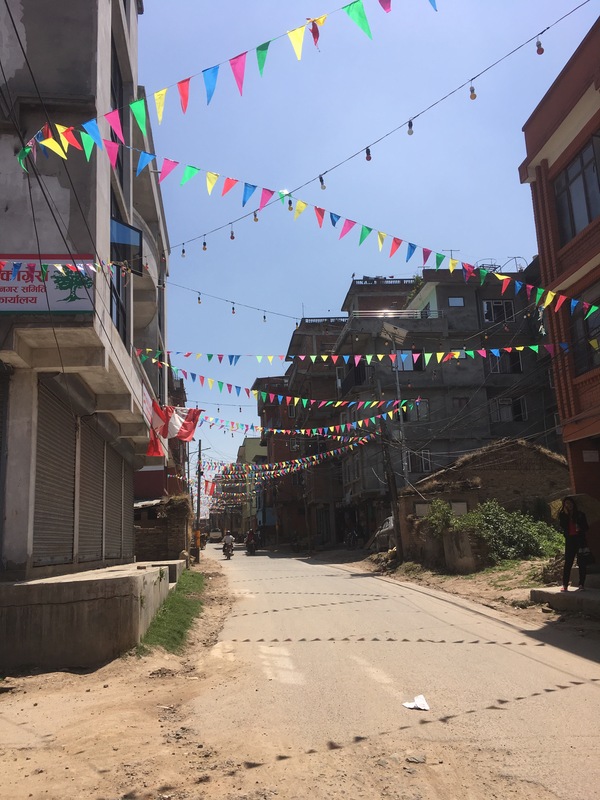 But could it be possible that we’re just as thrilled to return to Kathmandu, a city that, three weeks ago, felt foreign and frightening, but now feels safe and civilized? I’ll admit it: being at this high altitude, sleeping at almost 17,000 feet, makes me paranoid. We have barely felt it, and yet, seeing an Iranian woman lying unconscious beside me as I eat my dinner of fried noodles, watching as a helicopter arrives to fly her down to Kathmandu — I’m glad to be going down the mountains, too. Going down should be easy, right? But isn’t it funny that we walk for so long to reach a certain destination, only to turn right around and make the same journey back? Everybody talks about the way there; hardly anyone attends to the return home. 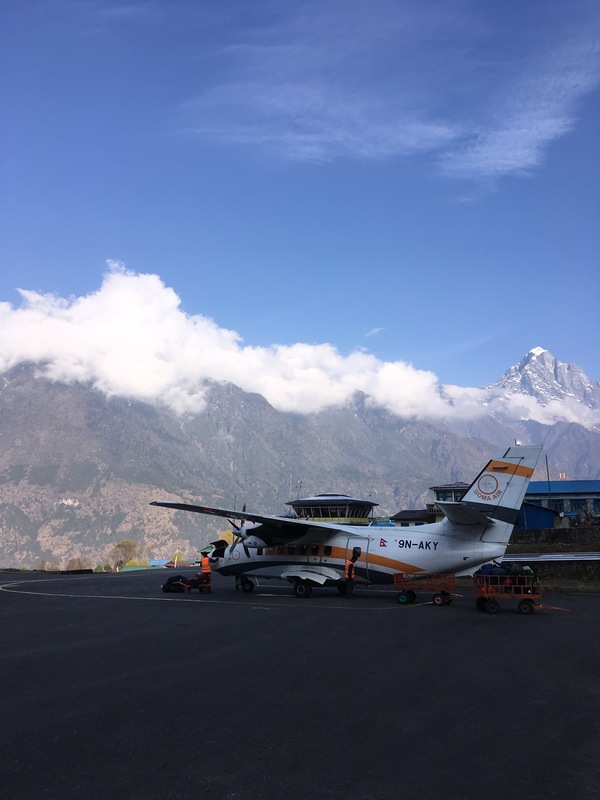 Like every other day on this trek, each day we hike back to Lukla, where we will catch a flight to Kathmandu, brings another challenge. In Pheriche, the elderly Nepali woman who gives us a room in her tea house asks if we would like a fire. Oh, yes, we say. It’s freezing. But the woman doesn’t seem to know how to light her stove, and we spend the evening with the rusted thing rumbling ominously in the center of the room, spouting billowy clouds of kerosene-clogged smoke into our blood-shot eyes. We open the windows so we won’t asphyxiate and eat our dinners of fried potatoes and pizza and hot tea taking turns sticking our heads outside. 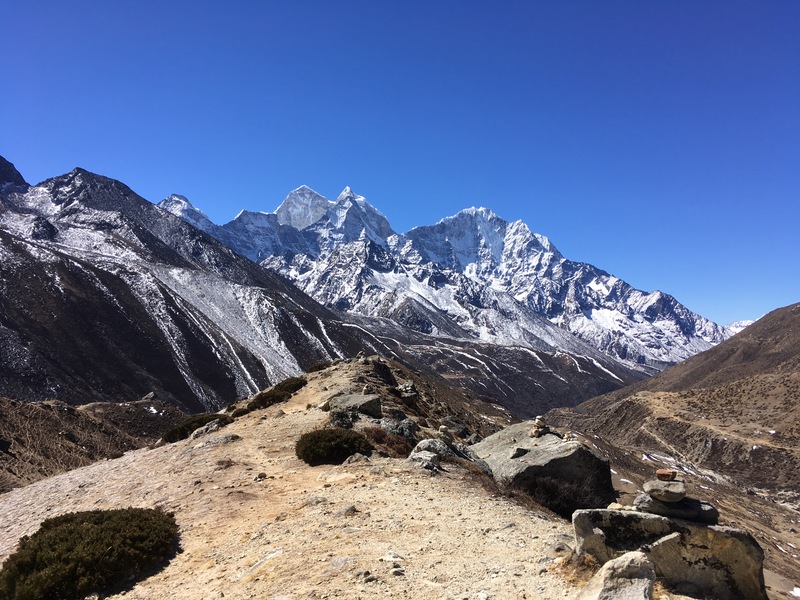 The hike from Pheriche to Namche Bazaar begins pleasantly, with clear blue skies and the towering form of Ama Dablam looking over us. 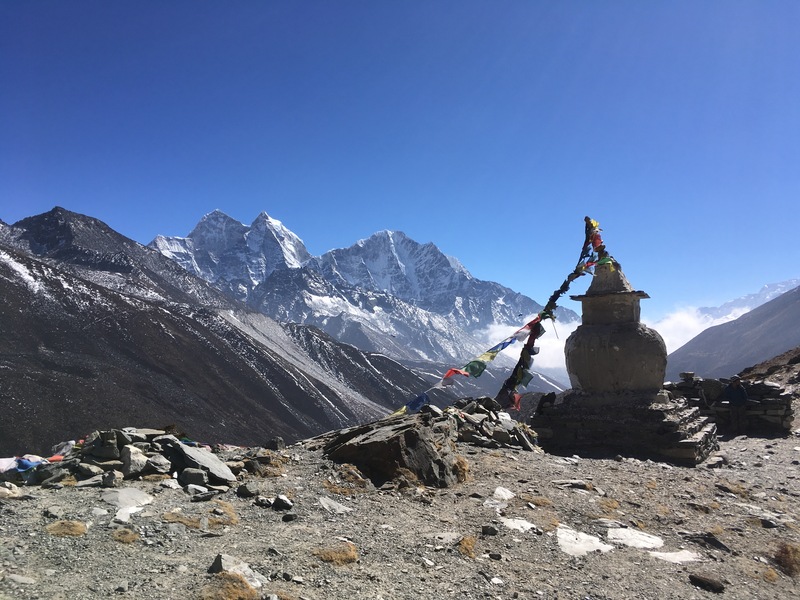 Most of the Sherpas view these mountains not as inanimate piles of rocks, but as spiritual beings, as goddesses to be honored. 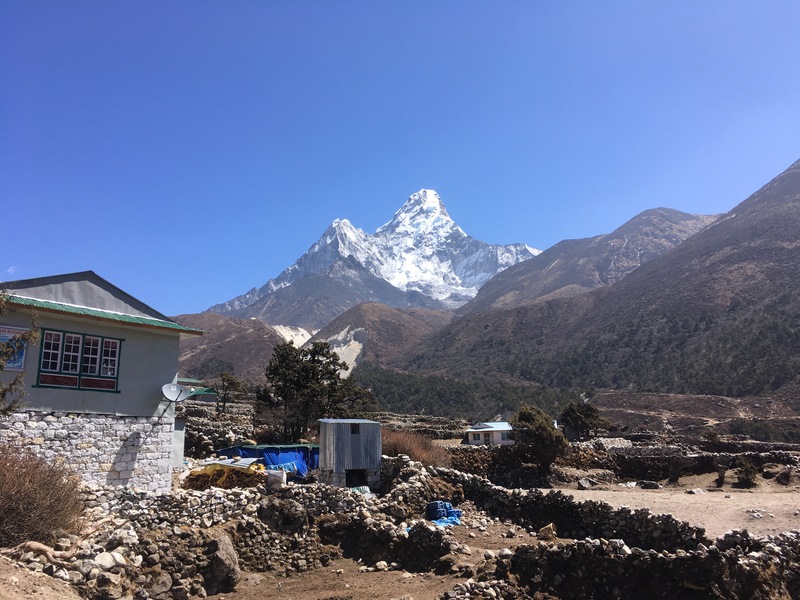 This whole trip, it’s felt as if Ama Dablam has been watching over us, her arms open wide in welcome, in love. But the hike soon becomes grueling. We walk this day what we did in two days on the way up. 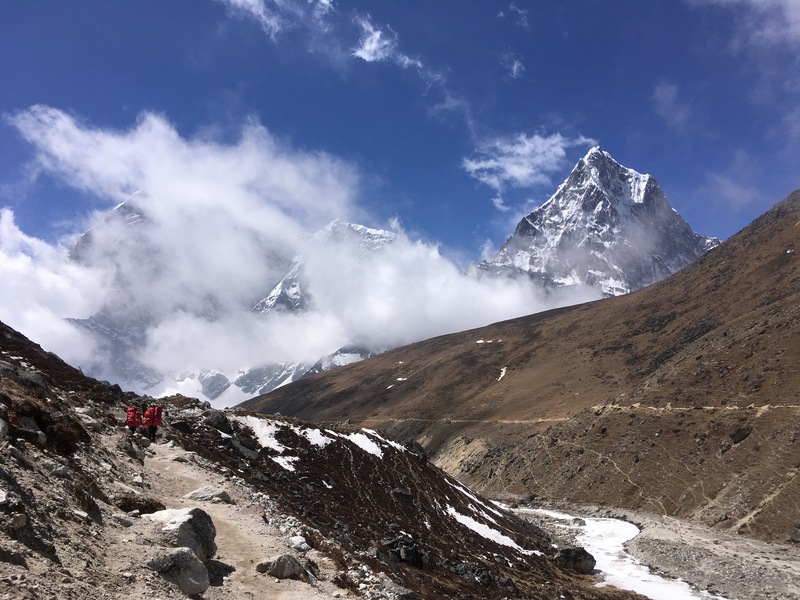 By the time we reach Tengboche, where we see a monk clad in rust red robes painting Om Mani Padme Hum in clean white on a gray boulder, our legs are heavy with fatigue, our stomachs rumbling with hunger. And we are only halfway there. My knee begins to hurt. Our packs seem twice as heavy as they did on the way up. As we contour around the mountains, a thick fog fills the valley, shrouding everything but the few feet of path in front of us. We know there is a sheer drop on our left, but we can’t see it. Rounding every corner feels like walking off the edge of the world. An owl hoots. A monal, a turquoise and emerald green pheasant which is the national bird of Nepal, waddles across the path and disappears into the woods. Several lone cows lumber down the trail, the metal bells around their necks clanking. Porters laden with toilet paper, beer, tin pans, bars of Snickers, all stacked in bamboo baskets on their backs and strapped around their heads with cotton strips, appear silently through the wall of fog, not looking up from the ground even to acknowledge us. How much farther, we ask? Did we really come this far at all? Many times during the trek, I have prayed silently to see something, some glimpse of God, some vision of His face in the mountains. After all, isn’t this the place to see it? In this trek through the mist, the sun momentarily slits through the clouds high above us, and there, where only blue sky should be, are the towering snow peaks of the Himalayas, floating as if baseless in a murky sky. This, I think, is what we see of God. A brief, majestic glimpse that’s fleeting and sudden and only visible if you lift your tired head from the dirt trail. Less than a minute later, the mountains are hidden once more. After eight hours of hiking, we reach Namche. There are some things the mountains do to you, and other things you do to yourself. In Namche, we count our money. We have been pinching pennies ever since leaving Namche the first time, when none of the ATMs in that cobbled stone town worked for us. 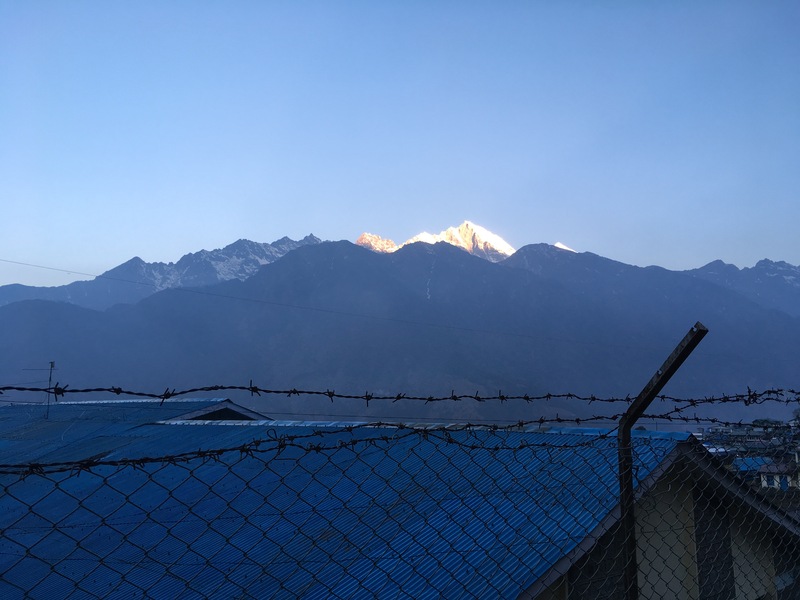 Once again, none of the ATMs spew money, and we realize we barely have enough to get back to Lukla, and only enough to stay in Lukla one night. In other words: not enough if our flight to Kathmandu is delayed, which is a real possibility. We want more than anything to go out to the Irish pub down the street for a beer, but we can’t afford it. I vaguely wonder what it would be like to beg for rupees from strangers, good-willing trekkers from foreign countries, Nepalis with little cash to spare. We kick ourselves for not being more careful. We console ourselves by saying, really, we were. We say a prayer before curling into our sleeping bags, worried. I think about the birds of the air and the flowers of the field. I think of manna raining down from heaven. I think of the five loaves of bread, stretched miraculously to feed five thousand. We’ve been shown our pure state: vulnerability. Now: will we be shown provision from above? Our host in Namche tells us the walk to Lukla will take six hours. Okay, we say. This is our last hike. We can do that. I think about the Buddhist monks we heard chanting low and earthly to a clanking wooden rattle in the red monastery in Tengboche several days ago. I could use some of their wisdom right now. Actually, I am fairly Zen for the first half of the day, when we hike down the steep slope from Namche, cross wobbly suspension bridge after wobbly suspension bridge over the frothy mint green water of the Duhd Kosi. I am especially Zen during lunch, when we enjoy the best dhal bhat — lentil soup with cilantro, curried vegetables picked straight from the garden, white rice, and chapati — for lunch at a blue-painted tea house. But in the afternoon, as we turn corner after corner, climbing higher and higher up endless stone steps to the mountainside village of Lukla, when it seems like the trail will never end and my backpack is crushing my spine and my legs feel like heavy weights I must heave out from under me — then, Emma and I ask each other, “Where the hell is this place?” I just want to get this over with. And just like that, we wake early on a Wednesday morning to muesli and hot milk served by a Nepali woman in the dark downstairs of her tea house. She goes upstairs to wake her son who is supposed to walk us to the airport in Lukla and help us buy our plane tickets back to Kathmandu. There is some confusion, and Emma and I think the plane leaves at 6, when really it doesn’t leave until 7 — if at all. The weather is precarious in the Himalayas, and these tiny propeller planes land by sight. The Nepali woman climbs the rickety stairs to wake her son. We hear her berating him in Nepalese. I don’t know what she’s saying, but I can imagine. Sometimes, cultural barriers are thin. The son leads us down the empty, cobbled streets of Lukla. Soon, the streets are not so empty. Other trekkers step out of lodges, backpacks slung on their shoulders and battered trekking poles clutched in their hands. They snap last minute photos with their porters and guides. They walk wearily up the mountain toward the airport on the side of the cliff. 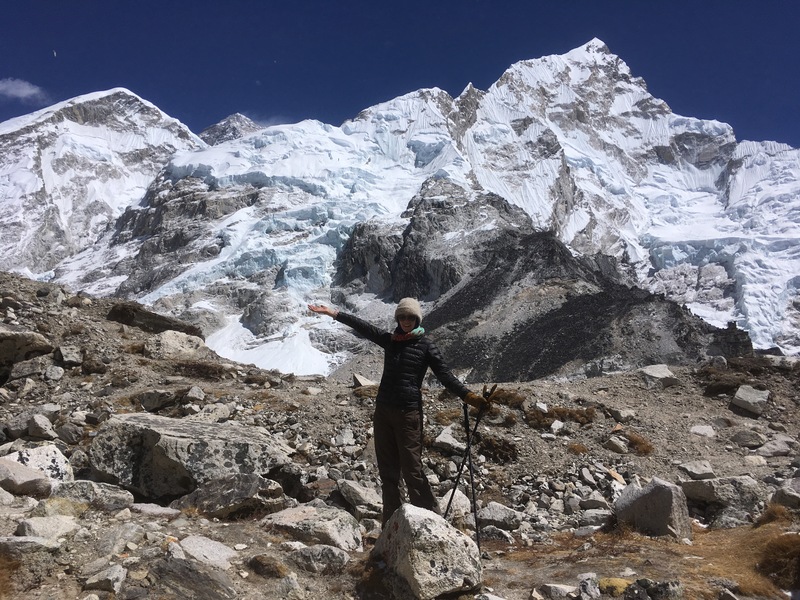 When Emma and I were planning this trek last fall, the thing that scared me more than anything else was the flight out of Lukla. 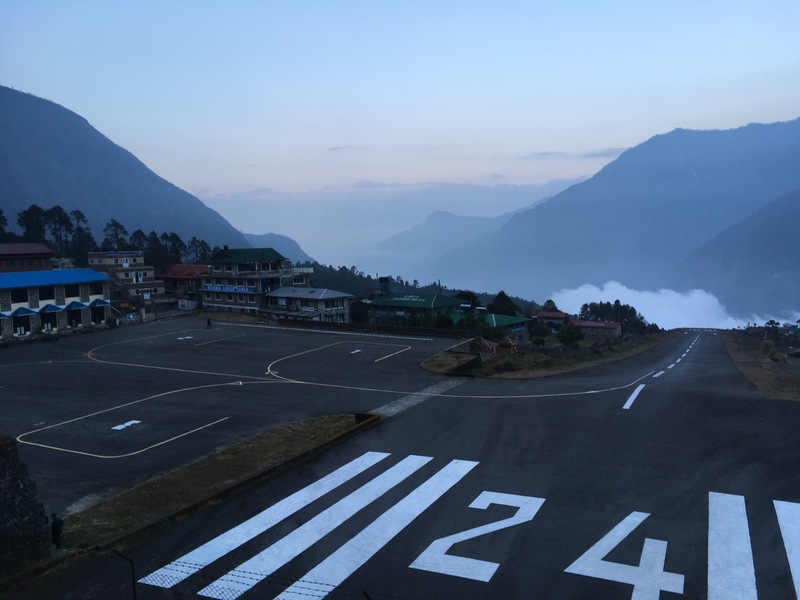 If you google “the most dangerous airports in the world”, the Tenzing-Hillary Airport in Lukla is always at the top of the list. There have been a number of plane crashes at the airport over the last few decades, most notably in 2008, when a Yeti Airlines plane crashed upon landing, killing all 18 passengers and crew. Only the captain survived. 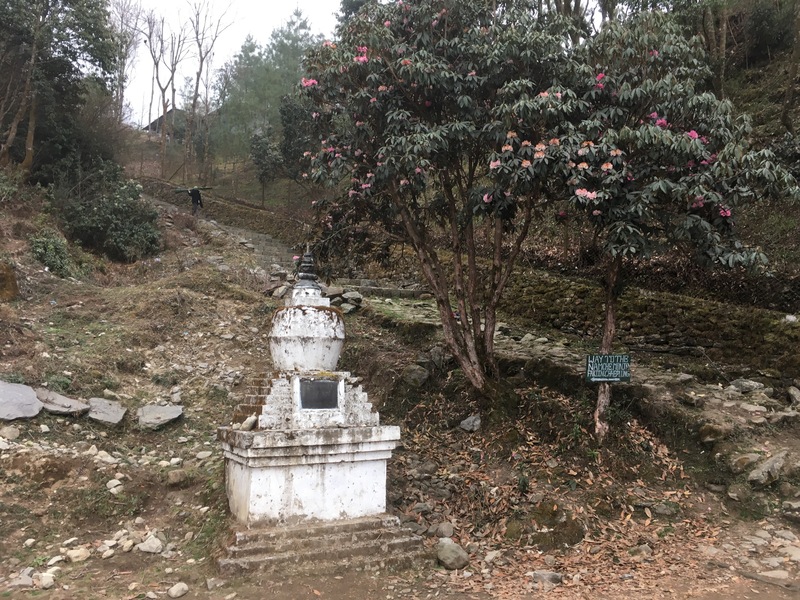 There is a chipped and faded white stupa in Lukla honoring the victims, which we passed on our way back from base camp. Back in Dallas, the thought of flying out of this airport terrified me. Even knowing flights flew safely in and out every day did not help. Even hearing about friends of friends who entered and exited the mountains through Lukla did not help. It was my biggest fear about the trip. I even had nightmares about it, waking in the middle of the night with one thought: I cannot fly out of Lukla. 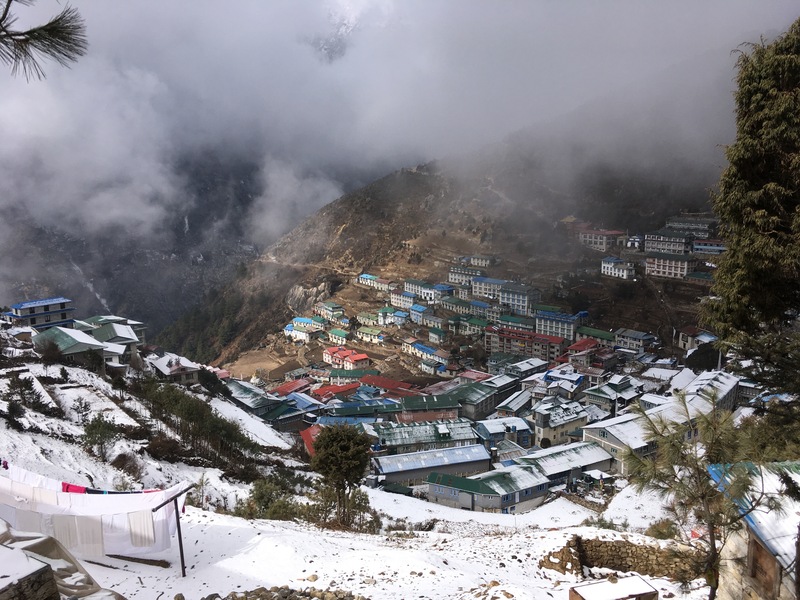 Now, after completing the trek, after surviving the harrowing ten hour bus ride to Shivalaya, after managing by ourselves in the mountains for three weeks, flying out of Lukla seems easy. I am not nervous at all. All flights are delayed because of the weather. A thick cloud bank fills the steep valley at the end of the runway, shrouding the airport from sight. Emma and I buy our tickets and go through security. There are two lines: one for men and one for women. The men’s line is a string of trekkers that fills the room. The women’s line is mostly the two of us. For every ten male trekkers, there is maybe one female. This makes Emma and me feel good. “No,” we say, and ever-trusting, she ushers us through. We sit in the crowded lobby until an hour later, when the sun burns off the clouds in the valley and four tiny propeller planes land one after another. We are shooed out onto the narrow runway and into the first plane that lands. A stewardess hands us balls of cotton and a hard malt candy each, and then, we are off! For a moment, my heart thumps bright red with fear and I clutch Emma’s arm. Then, we are rolling down the hill and only seconds later lifting off above a sheer drop. What scared me for months is over in a few wild heartbeats. Now, we soar above the clouds and one more time I see the snowy peaks of the Gaurishankur Mountain Range out the window. As we fly over, I think: we walked all this way. Kathmandu is jarring. The mountains, for as difficult as they are, were peaceful. Life in them is getting up, freezing, eating bowls and bowls of soup and rice and lentils, hiking, hiking some more, thinking you will never stop hiking, staring in amazement at a mountain and realizing there’s more mountain above that’s folded in billowy grey clouds. It’s falling asleep, hard, and not waking until morning. But Kathmandu, this city is a bustle of dogs snarling and car horns honking and construction workers clanking away outside. It’s a shower, yes, though not as hot as we’d like. It is heavy ceramic pots of fresh brewed coffee and creamy, sugary masala tea. It is a quiet, flowered garden. It is dodging motorcycles and taxi cab drivers trying to sell you a ride, your shoes muddy from the streets that are muck after a heavy rain. 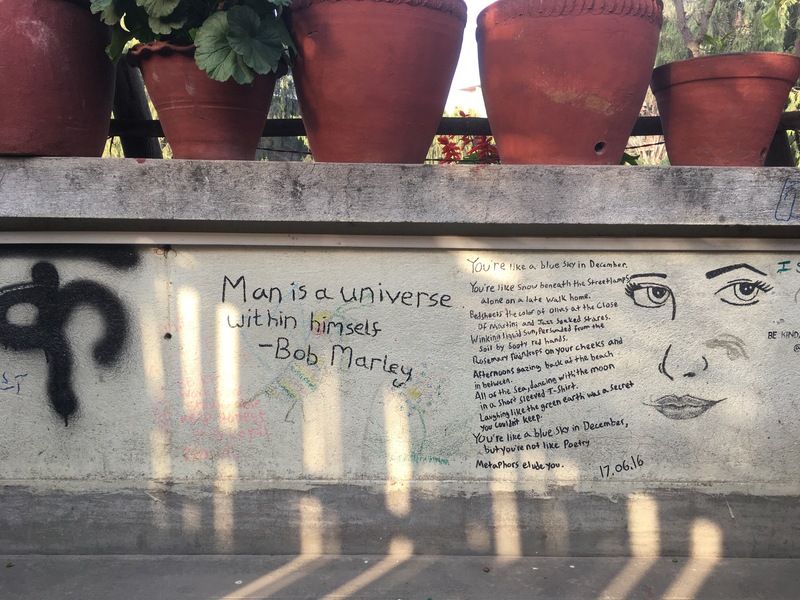 Emma and I move into a popular hostel in Thamel, the city’s tourist district, and suddenly, we are surrounded by young, hip travelers from all over the world, eating veggie burgers and smoking cigarettes and reading Siddhartha on the roof in the sun. Justin Timberlake plays over the speakers. There is good, strong WiFi and a restaurant that serves Western food. It seems too soon. I’m not ready to be friendly. I’m not ready to swap stories about lives lived on separate continents with adventurous strangers who travel the world. I escape down the street into a Tibetan and Nepali Buddhist bookstore, and flip through tomes about this foreign religion in a momentary quiet solace. I wish I were going home. I wish Kathmandu weren’t so busy. I wish I didn’t have to act like a normal person just yet. I wish I could see the mountains once more. After going and going and going every day, my body doesn’t know how to be still. I am sore and still scraping the dirt off my skin. I am a rush of emotions that hits me all at once, so tangled up I can’t discern one from another. 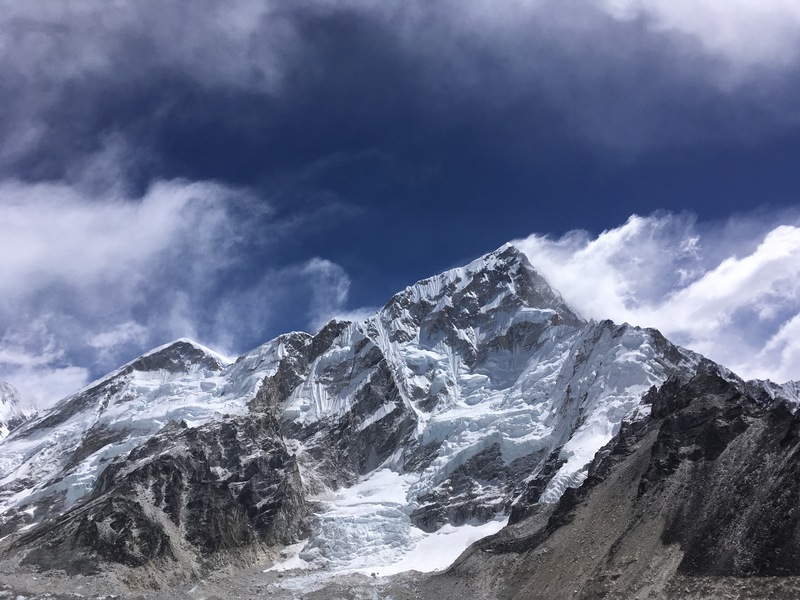 We go out for pizza at a ritzy Italian restaurant, Fire and Ice, popular amongst trekkers who’ve just returned, and I think about the porters carrying huge loads of beer and tents and chairs up the mountains to base camp. So many of them travel through the night. In the morning, I go out for coffee at a trendy spot down the road and read the Kathmandu Post in English. On the way back, I see a beggar dragging two useless legs in the dirt behind him. He sticks up his hand, reaching out gnarled fingers to me, unable to fully lift his head to meet my eyes. I don’t know what to do, so I keep on walking. 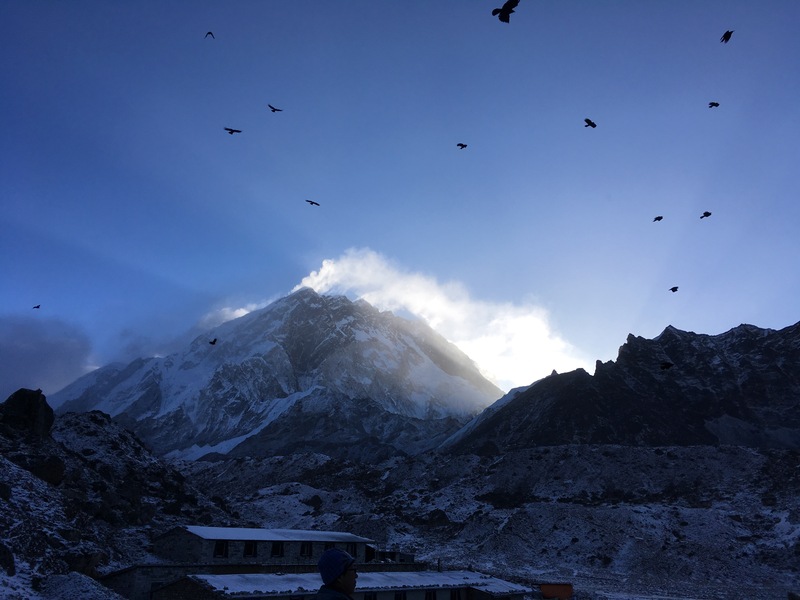 In the evening in Dingboche, I look out our lodge’s windows to see the sun setting upon the mountains and have to go outside. I find a seat perched upon a stone wall and watch as the slanted rays cast cold blue light upon the steep, snowy slopes. 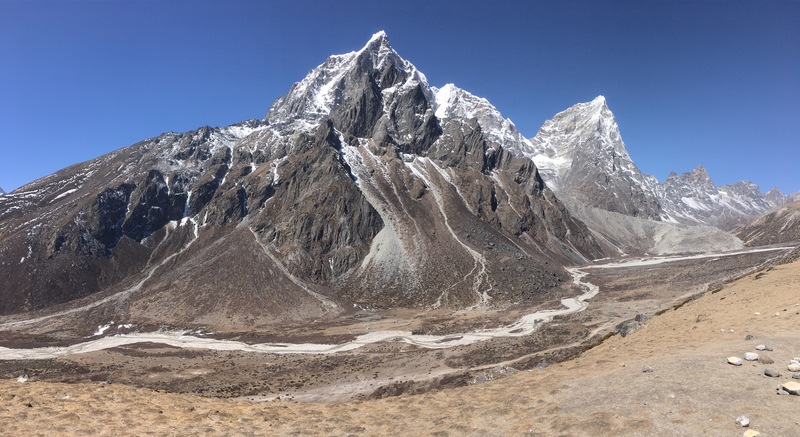 Ama Dablam is a towering pyramid to my left, her base in dark shadow, her peak illuminated in white light. The other mountains around me turn clear blue by the setting sun; one is so bright, it looks translucent. Staring at these towering Himalayas in all their shining majesty, my breath catches in my throat and I am suddenly dizzy. The cold is in my lungs, freezing my blood. 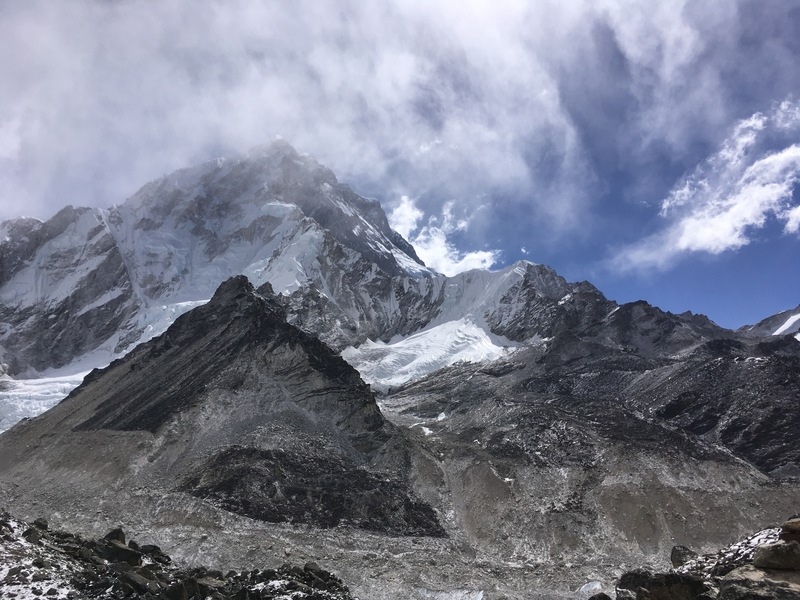 I get up, go inside, but the lodge’s dining room is hot from the yak dung stove and crowded with trekkers who exhale huge quantities of carbon dioxide. I sit on a carpeted bench in that stuffy room and clutch my chest, finding in each breath not enough air. The suddenness of this lack of oxygen, and the fear it brings, sharpens me to a point. I am one thought: I cannot breath, I need more air. I go upstairs to our chilled room and take big breaths, sipping the icy air, finding that it does, indeed, fill my lungs. I am relieved, but nervous; we still have another 3,000 feet to climb. 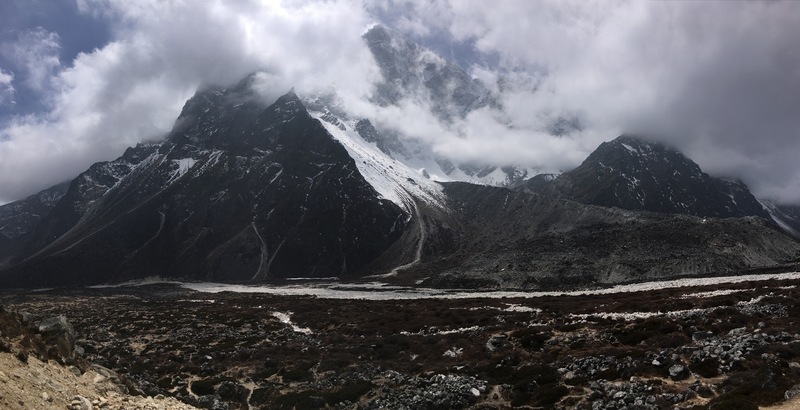 The next day, we hike another 1,500 feet to the small village of Lobuche. Halfway up, my head begins to ache. 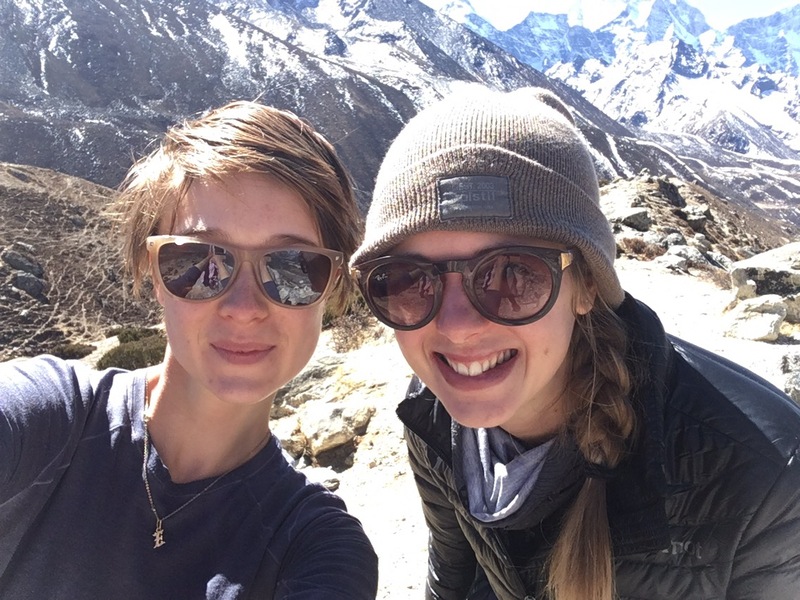 A Nepali guide to a group of trekkers from India asks if Emma and I are all right. I tell him about the headache. “Drink lots of water and wear chapstick,” he says. We will run into this guide half a dozen times between now and arriving at base camp, and every time he sees us he asks us how we are and gives us a little trekking advice. In Lobuche, my head hurts more. I am not prone to headaches, and this may be the worst I’ve ever had. It makes me nervous. On the wall of our lodge there is a sign indicating the symptoms of acute mountains sickness. One of them: headache. Of course, headaches are also simply common at high altitudes. So should I be worried? I drink bottles of water with cherry flavored electrolytes, Emma and I say a prayer in our cozy room, and the headache goes away. That night, though, I am paranoid. This high altitude does a number on my sanity. I cannot fall asleep. I take full breaths of thin air, and with each expansion of my lungs, I wonder, is there liquid in them? Am I breathing normally, or am I gasping? In reality, I am breathing better than I have since rising above 12,000 feet, but you can’t tell a restless mind that. I sleep fitfully, dreaming about the mountains and the snow. When I awake in the dark in a stupor, I think blindly that my pillow, angled up and away from me, is Mount Everest. 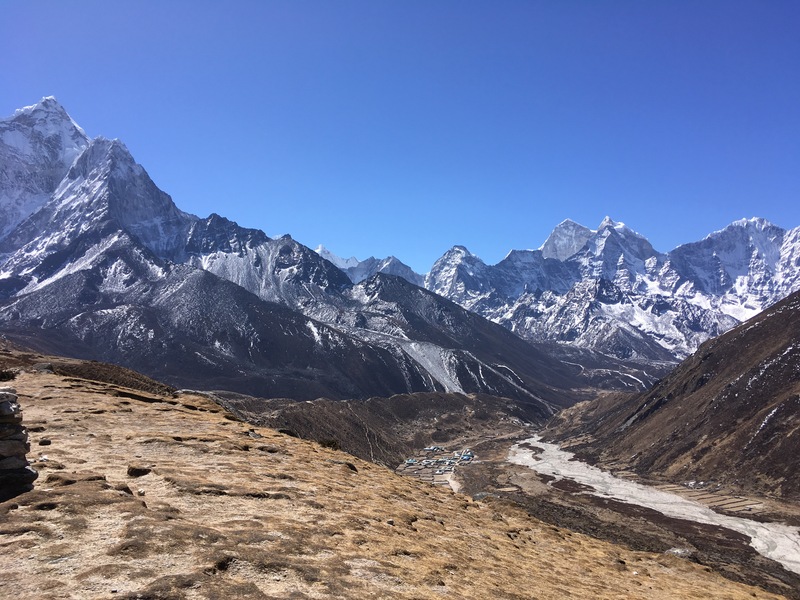 According to my Lonely Planet guide book, the hike from Lobuche to Gorak Shep should only take two hours, and then it is a three hour hike to base camp itself. Of course, the guide book doesn’t take into account the raging wind ripping down the valley right into our exposed faces. This final hike is the hardest of all. Every few minutes, we must stop and turn around, using our backpacks to shield us from the brutal wind. I am aware that we are now surrounded on all sides by the towering Himalayas. The earth is ground gray stones and looming boulders. The mountains are bright white and silver. No tree or shrub grows here, only dark green moss and lichen. I see little of this, though, with my head bent down against the wind. 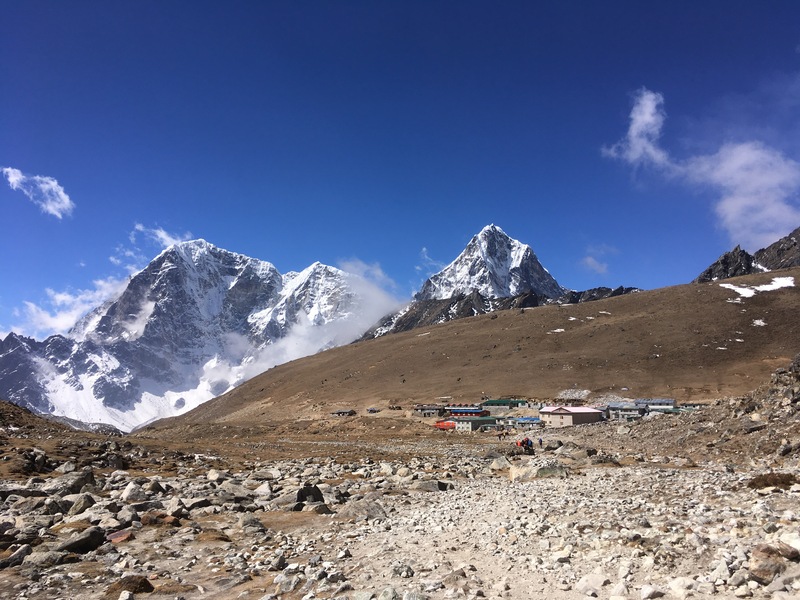 My thoughts are only on getting there, getting to our lodge in Gorak Shep, getting to our destination: base camp. And also: a slight tinge of worry about the headache that’s returned. 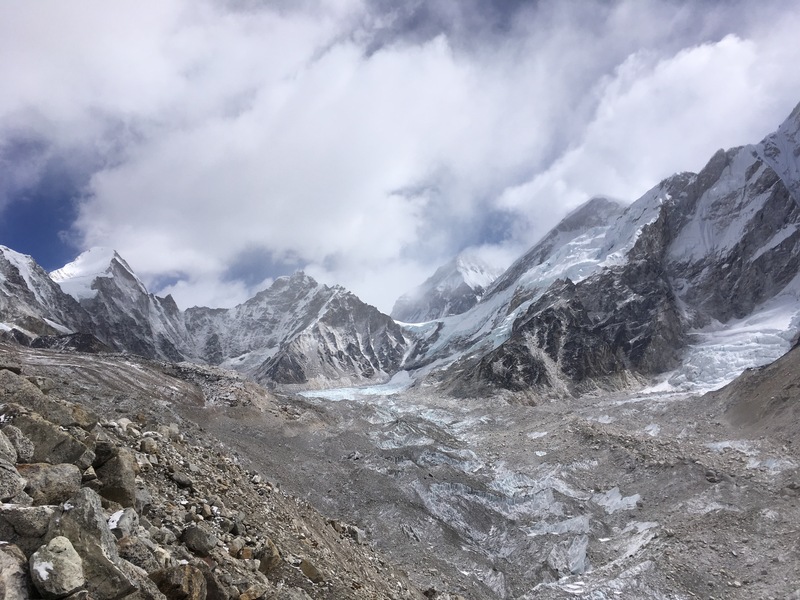 It takes us three miserable hours to get there, but like everything on this trek, it’s worth it when we summit the ridge above Gorak Shep, a village of only several stone lodges, to see the triangular peak of Mount Everest with her familiar white contrail standing permanently above us. 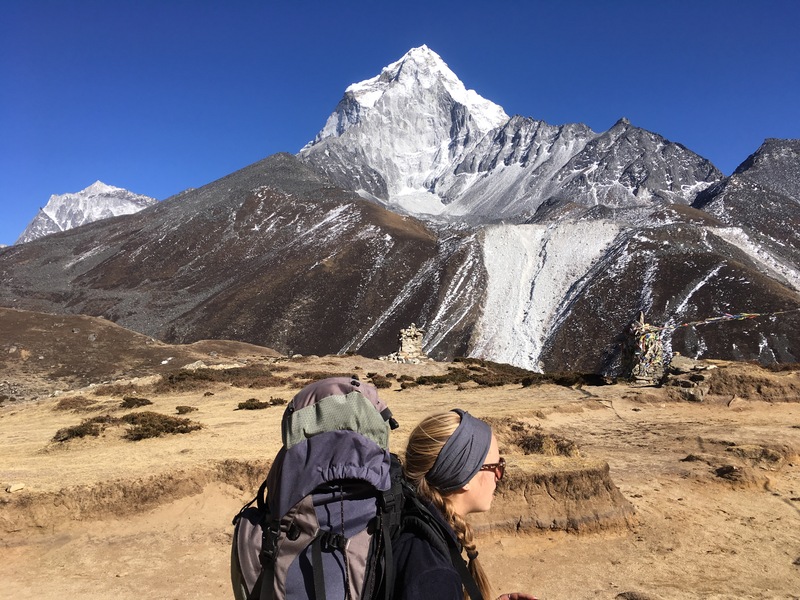 We leave our heavy packs at the Buddha Lodge in Gorak Shep and start down the rocky trail toward Everest Base Camp, our destination which we’ve come so far to see. Hiking without a pack is wonderful. I feel light and free. I could run if only the path weren’t so steep and my lungs weren’t hurting from so much heavy breathing at this high altitude. 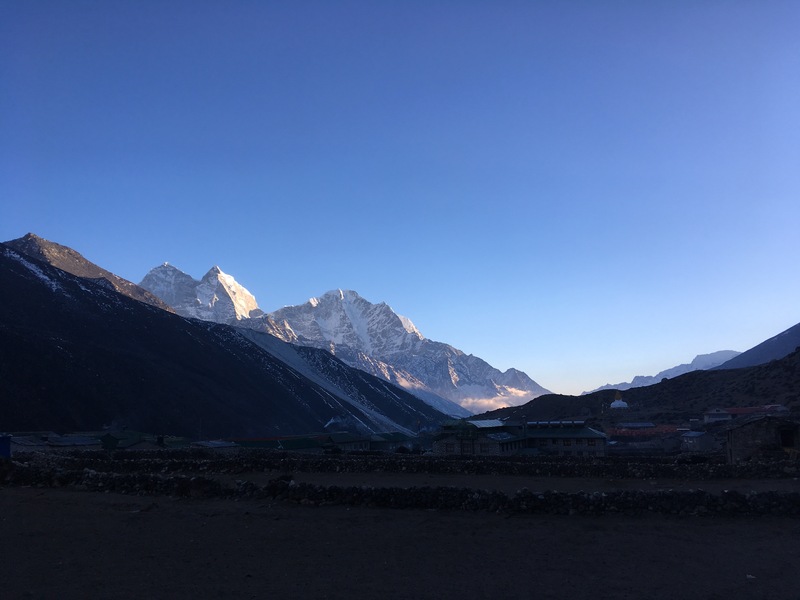 Soon, Everest appears on our right, a triangular peak behind the snowy mountains before her. 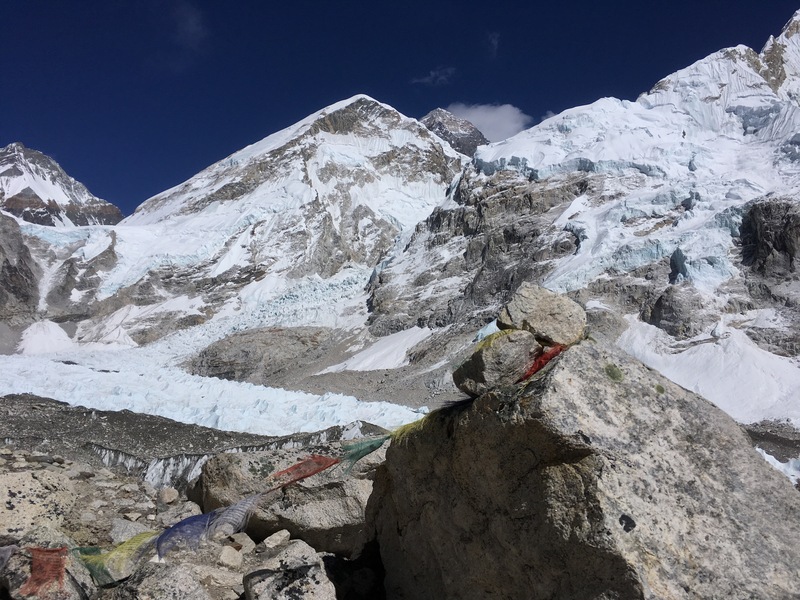 She is clear this afternoon, and as we cross a narrow ridge that overlooks the Khumbu Glacier, she grows larger. She is dark grey with white streaks of snow. I wish I didn’t have to concentrate so hard on placing my feet amongst the boulders. I wish I weren’t breathing so hard. I wish it weren’t so bitterly cold. Then, I could stare endlessly at her slopes, and consider what it means to see the tallest point on earth. 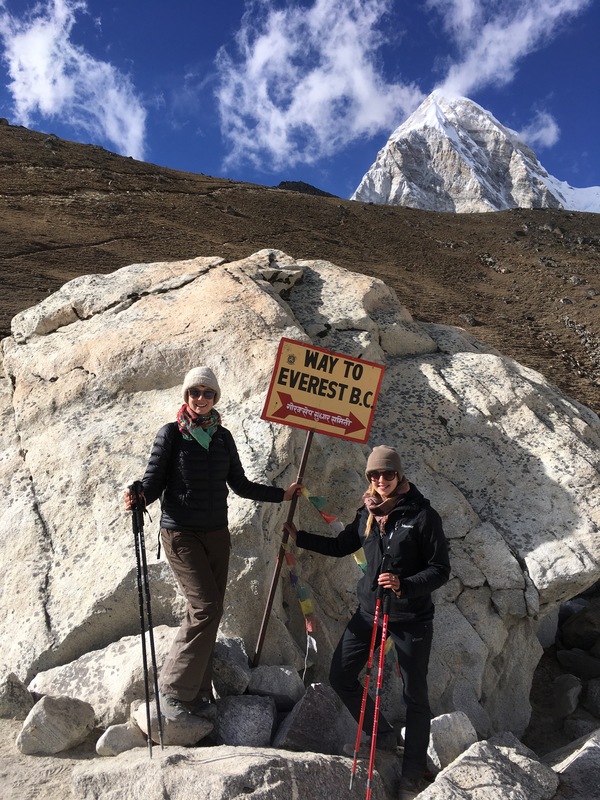 We are a string of trekkers from every corner of the globe hiking one by one toward the orange tents and tattered prayer flags at the base of the Khumbu Ice Fall that marks Everest Base Camp. Each of us have come so far to see that mountain, the tallest point on earth, and to stand at the camp that leads to her top. I wonder why so many trekkers have come here. Simply to see her? To say that they did it? To know that they can hike this far this high this long? 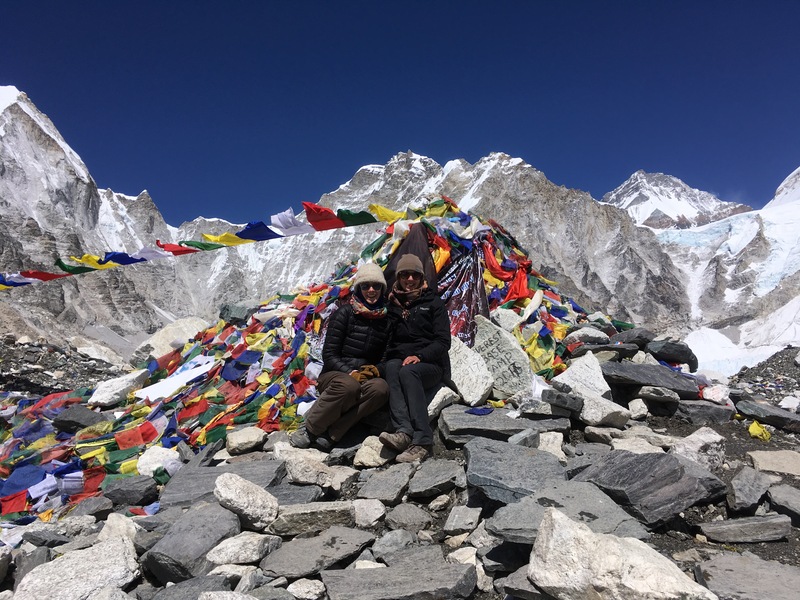 We cross the glacier, a thick slab of light blue ice covered in dust and gravel, and then we are here: at Everest Base Camp. 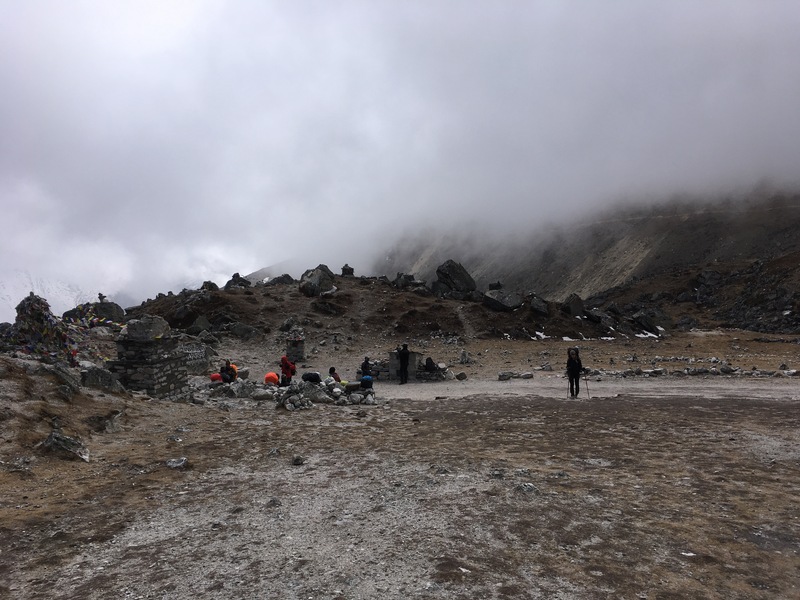 Many trekkers and bloggers told us that base camp is anticlimactic, but in what universe could this be the case? We are surrounded on all sides by the Himalayan Mountains. A sliver of Mount Everest is still visible behind snowy Nuptse. 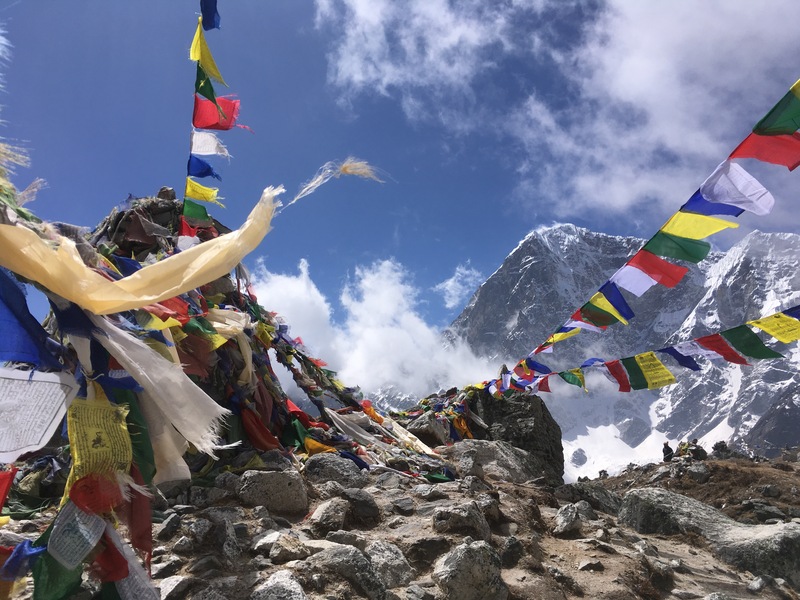 Trekkers cheer one another as they reach a pile of stones and prayer flags that mark the end of this pilgrimage. I cannot believe we are here. After 18 days of hard hiking, sometimes over 8 hours a day, sleeping in frigid lodges, not showering but once, we’ve reached base camp. If it is anticlimactic, it’s only because nothing really happens at the end of this pilgrimage. One trekker from Baton Rouge asks me if I’m going to bury anything here, to leave anything behind. Surprised, I tell him I hadn’t thought about it. You should, he says. Why, I ask, is that common? It is, he says, it’s a way to mark the end of this strange route. Emma and I find a boulder some ways away from the celebratory trekkers to sit in silence and eat Snickers. I wonder, what does it mean to see the tallest mountain in the world? What does it mean that we’ve come all this way to see this cluster of orange tents on a glacier at the base of a mountain? Certainly it is the wildest, most stunning place I have ever seen. And certainly I have pushed my mind and body to limits never imagined to get here. But now what? I’m surprised to find that we’ve reached the end. I’m ready to find the next peak, to keep on trekking. I could walk all the way to Shambhala. I am also ready to go home. You are currently browsing entries tagged with travel at elizabeth hamilton.